18th.April to 22th.April, both inclusive, for Easter. As you know, the widespread use of e-mail has led to the proliferation of a large number of Identity Impersonation Post (PHISING) that circulate continuously over the Internet. Phishing messages try to impersonate the identity of a reliable entity, to distribute misleading information, requesting confidential data and passwords from users or sometimes try to encrypt the data of the recipients’ computers to extort later if they want to restore such data. We often see cases of this type in the media. In an attempt to combat this type of malicious communication, all e-mail service providers have taken measures to prevent these problems and have established controls (filters) on all emails, before being sent. However, these emails are increasingly sophisticated, so that, in a short time, they are able to overcome these filters again. Dynatech has discovered that some emails of this malicious type could have been sent from the internet, using our email addresses. These may contain links (links to websites), which are considered to be potentially dangerous. Valid Dynatech emails will never ask you to provide a password or click on any link except informative links that always carry our web addresses that contain “dynatech-elevation.com”. They contain files sent as attachments, which are potentially dangerous if they are opened or executed. We recommend that you make sure before opening the files and, if you have any questions, consult us about the authenticity of it or if we have sent you that e-mail, using a different e-mail (do not reply to the mail you consider may be malicious) or by telephone. Make sure that all the addresses that appear are from the dynatech-elevation.com for communication from staff and the domain dynatech-core.com for general communications and management related to our client area. Previously, some of these emails had addresses of free providers such as @ gmail.com @ hotmail.com @ yahoo.com. It is common to have slight misspelt versions of well-known or established domain names, but careful analysis can reveal these irregularities. If you have any doubt or further questions, please do not hesitate to contact us. After 22 years on the market, the unidirectional progressive safety gear PR-2500 will be withdrawn from our product catalogue from September 1, 2018. However, Dynatech will continue to ensure the supply of spare parts for this safety gear. The more advanced range of unidirectional ASG safety gears offer much more versatility and capacity, effectively rendering the PR-2500 obsolete. Dynatech will no longer accept orders for this product after July 31, 2018. At DYNATECH, we are pleased to inform you that we will be present at the next World Elevator & Escalator Expo 2018 in Shanghai. You will be able to visit our stand 8353, in Hall 8.2 (Hall 8, 2nd floor) from May 8th to 11th. Our dedicated team will extend a warm welcome to any visitor to our stand where we will be showcasing all its products, especially those officially certified for the Chinese market. 29th .March to 2nd.April, both inclusive, for Easter. 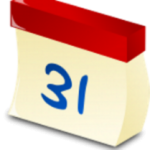 30th.April and 1st May, national holiday. 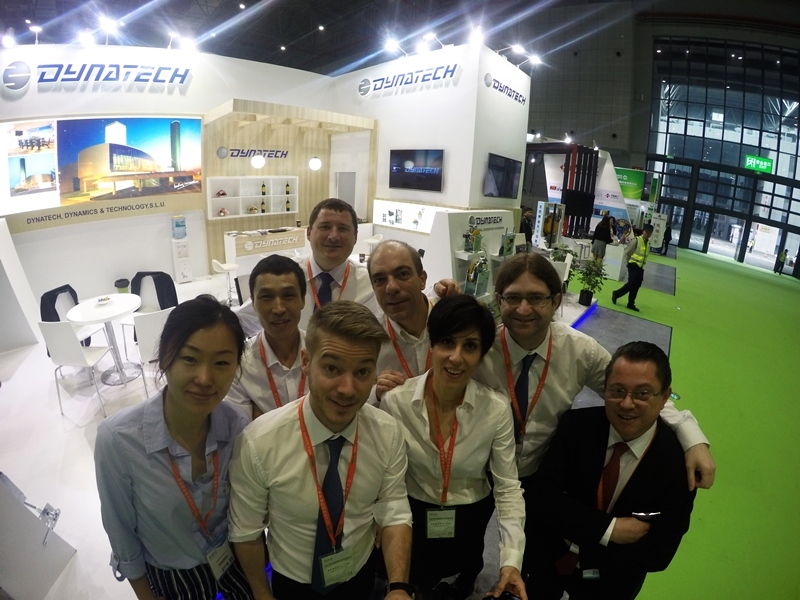 May I take this opportunity to thank you on behalf of the entire Dynatech team for your visit to our Interlift stand. We sincerely hope that you enjoyed a pleasant but, above all, interesting and fruitful meeting thanks to the innovations we have made in all areas of the company: Product, Management, international reach, etc. For those of you who have not had the opportunity to visit us, we hope to see you at the next international event, in Shanghai 2018 or Interlift 2019. Dynatech continues to work on its forthcoming new generation of safety components which we will present at the events mentioned above or through our website. Keep in touch, the future is almost here. We are pleased to inform you that Dynatech will be present at Interlift 2017, from October 17 to 20, at Stand 7151, Hall 7. Do not miss this opportunity to visit us! New products, new developments, new management system, etc. not even announced on our website or in our bulletins yet. 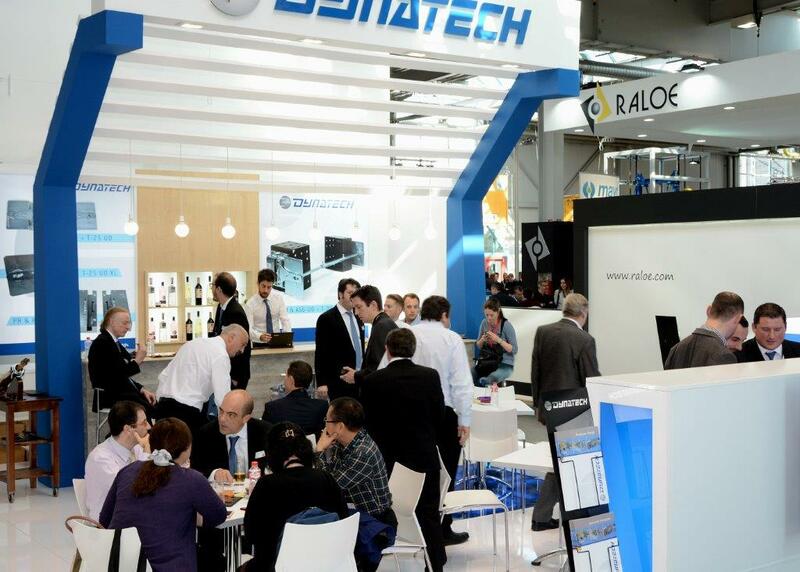 Over the course of the Interlift exhibition, Dynatech staff will update you on everything and explain the fundamental benefits that each improvement will bring. A battery of innovations that demonstrate Dynatech’s unceasing objective for continuous improvement. In addition, to give your visit a sense of fun, there will be a range of entertainment and refreshments on offer that will make our stand an experience to remember. If you are planning on attending the event, please contact us to ensure free tickets. 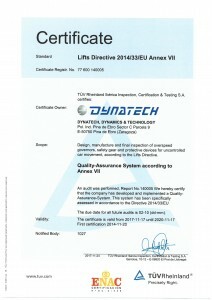 Dynatech now has the Lifts Directive 2014/33/EU, Annex VII Certificate. 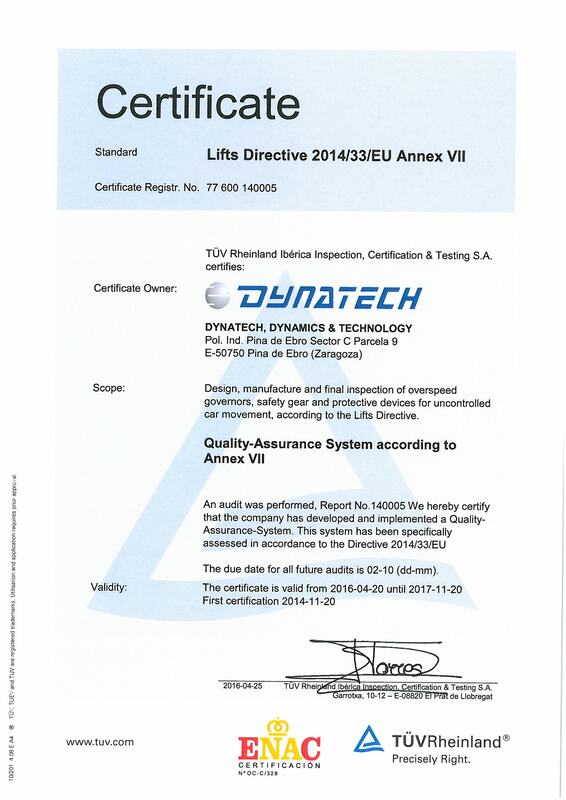 We are delighted to inform you that we now have the Lifts Directive 2014/33/EU, Annex VII Certificate, issued by the accredited body Tüv. LBD-200 and LBD-300 will remain as governors according to EN 81-1 / EN 81-2. As stated in due time, Dynatech governors LBD-200 and LBD-300 they both were not updated in accordance with the European Standards EN 81-20 / EN 81-50. Therefore, these governors WILL NOT be covered by the European regulation from 31st August of this year. In order to meet the above mentioned European standards, VEGA and VEGA 300 are the ones certified according to EN 81-20 / EN 81-50. Should you have any question, please do not hesitate to contact Dynatech. 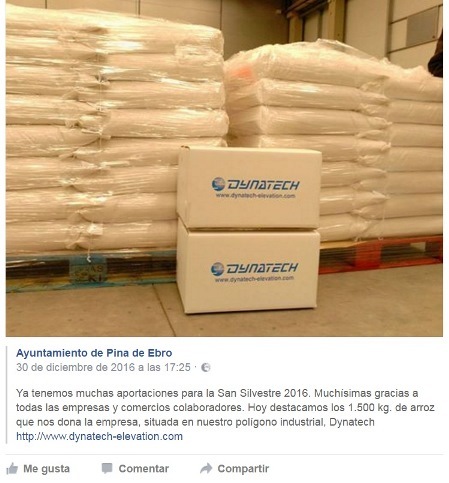 As every year, Dynatech has delivered 1.5 tons of non-perishable food to the Pina de Ebro Town Council food bank, for distribution to the most disadvantaged people. 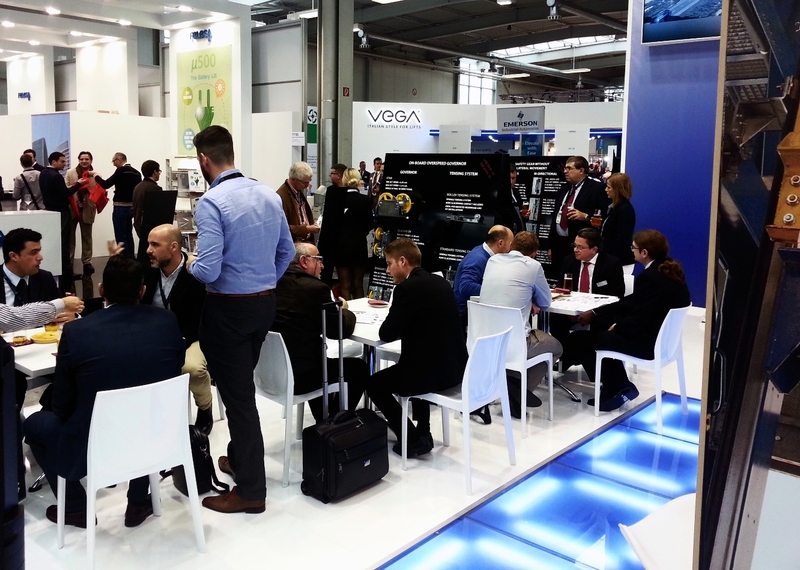 It was a great satisfaction for us at DYNATECH to take part in this great event, which brought together most of the major brands in the world of lifts; from the most famous in the sector, such as OTIS, KONE, SCHINDLER, THYSSEN, HITACHI and MITSUBISHI, rubbing shoulders with the most important component manufacturers. 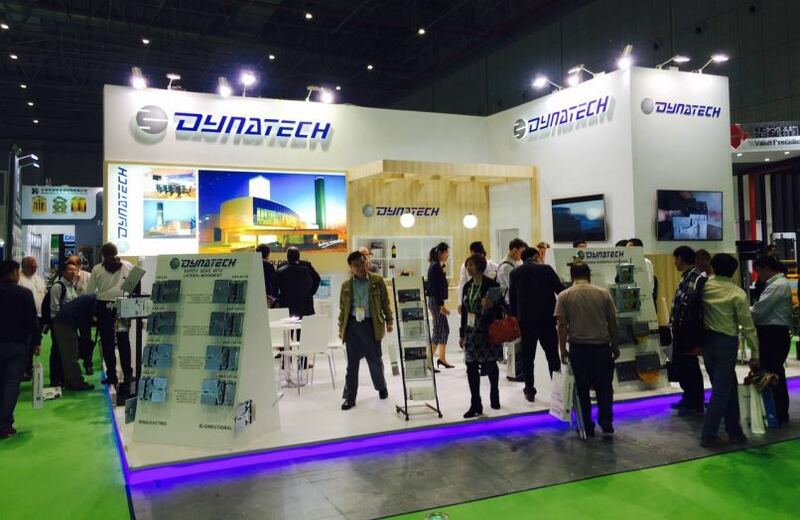 We at DYNATECH appreciate the spectacular reception given to us by the public and the extraordinary interest shown in our new designs and products specifically for the Chinese market. At DYNATECH, we are pleased to inform you that we will be present at the next World Elevator & Escalator Expo 2016 in Shanghai. You will be able to visit our stand 7233, in Hall 7.2 (Hall 7, 2nd floor) from May 10th to 13th. Our team will be happy to give you a warm welcome at this event where DYNATECH will be showcasing all its products, especially those officially certified for the Chinese market. Furthermore, later the same month, from May 25th to 26th, DYNATECH will be present at LIFTEX 16 in London, at Stand B20 occupied by our distributor, GLOBAL LIFT EQUIPMENT. Our distributor will be pleased to offer you its hospitality, as well as extensive information about our UCM solutions, renewal systems for existing lifts and our products, in general, according to the new Lift Directive and EN81-20/50 Standards. From April 20th, and following the regulatory change, Dynatech will manufacture the safety gear IN-3000 G10, which will replace the IN-G10. All instantaneous safety gear manufactured by Dynatech, from that date on, for the 10mm guide rail will be the IN-3000 G10 model. For frame manufacturers and installers, this change will not involve any modification to their practices; as the dimensions and attachment hole positions will be exactly the same as for the IN-G10. The IN-3000 G10 safety gear is included in the general certificate for the IN-3000, according to the new standards EN-81:20 and EN-81:50 and the new Directive 2014/33/EU. This certificate and the updated manual will be issued on April 20th. In addition, the maximum P+Q for its use has increased significantly (e.g. from 2348kg to 3364kg for a tripping speed of 1m/s). 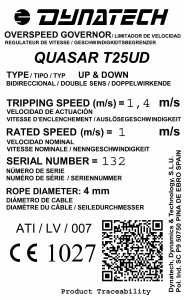 We would like to inform you how the entry into force of Directive 2014/33/EU on April 20th, 2016 affects the UCM units consisting of the ASG safety gear, the D-BOX electronic device and the STAR, VEGA or QUASAR T-25 overspeed governors. The new Directive classifies these UCM units as part of the safety system and, as such, they need to be subject to EU type certification. Our UCM units already have this type certification issued by the accrediting organisation, TÜV Rheinland. These certifications will be updated by the same agency as EU type certificates from April 20th, 2016. Previously, the safety gear and overspeed governors included in it were also certified according to standards EN 81-20 and EN 81-50. 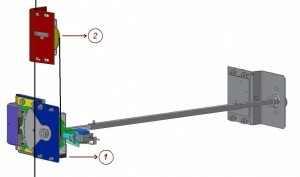 From this date on, the D-Box may be used only as part of one of the three UCM units, and Dynatech will issue a declaration of conformity for the UCM unit installed, as is done with other safety components. The D-Box, as well as the safety gear and overspeed governors included in the UCM unit, may be purchased and stored separately, and the components the customer has in stock may also be used. 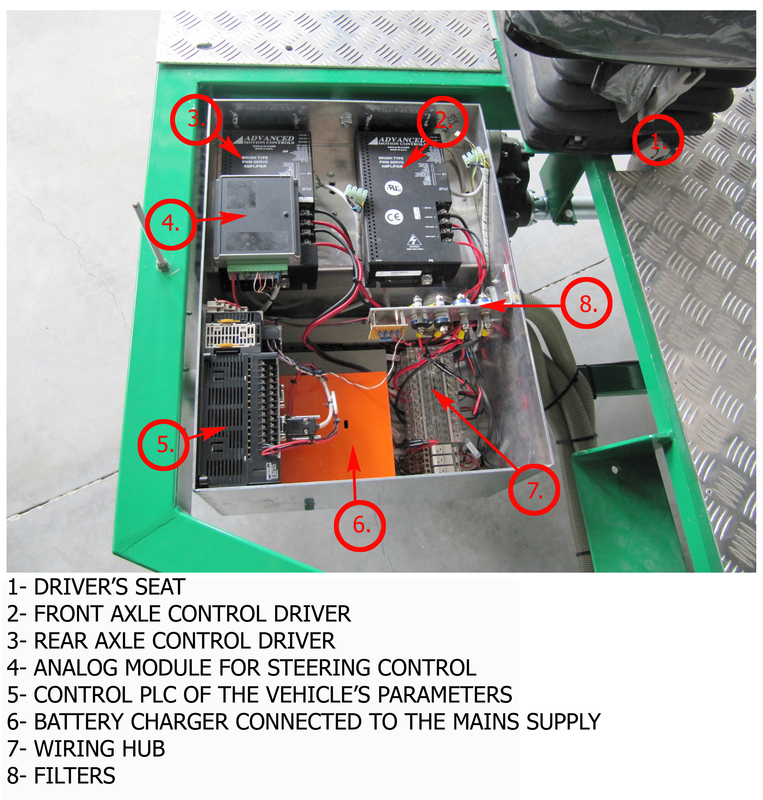 The only requirements will be to request a declaration of conformity for the appropriate UCM when being installed in the lift, and to indicate the serial number of each component (safety gear, overspeed governor and D-Box) comprising the UCM unit. Dynatech is pleased to inform you of the following products which have been recently certified under current Chinese regulations. Name: SUARCOM LUOYANG ELECTRONICS Co. LTD. Thank you for trusting in your global supplier of lift safety systems. As we did last year, with the aim of alleviating the needs of underprivileged people, Dynatech has donated 1.5 tonnes of non-perishable food to the Pina de Ebro City Council, which will be shared by the City Council’s community kitchen and CARITAS Charity Organisation. Sometimes communities of residents cannot afford to renovate or upgrade the safety of their lift because of the cost involved. 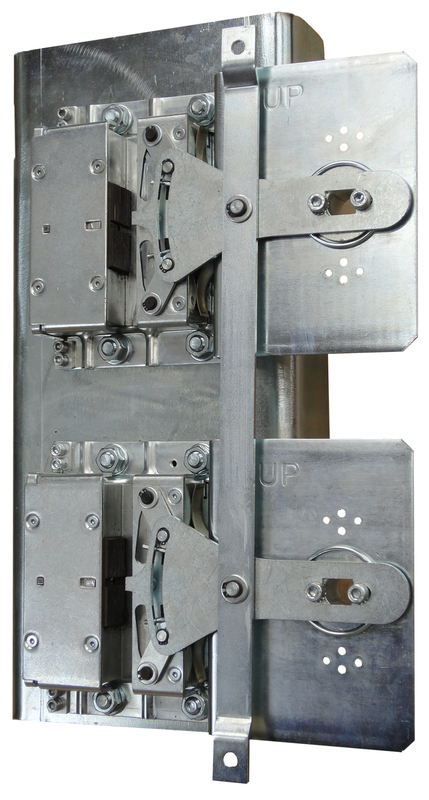 Dynatech now offers a quick and inexpensive way to update the safety of an existing lift, including a complete UCM unit if desired. This solution significantly reduces the time spent on lift interventions, thereby minimising the inconvenience to the community when the lift is out of service. In addition, its low cost, compared to that of a larger renovation, provides a competitive advantage to any company offering our solution over the competition. And who knows, a satisfied customer may even provide a new maintenance contract …! 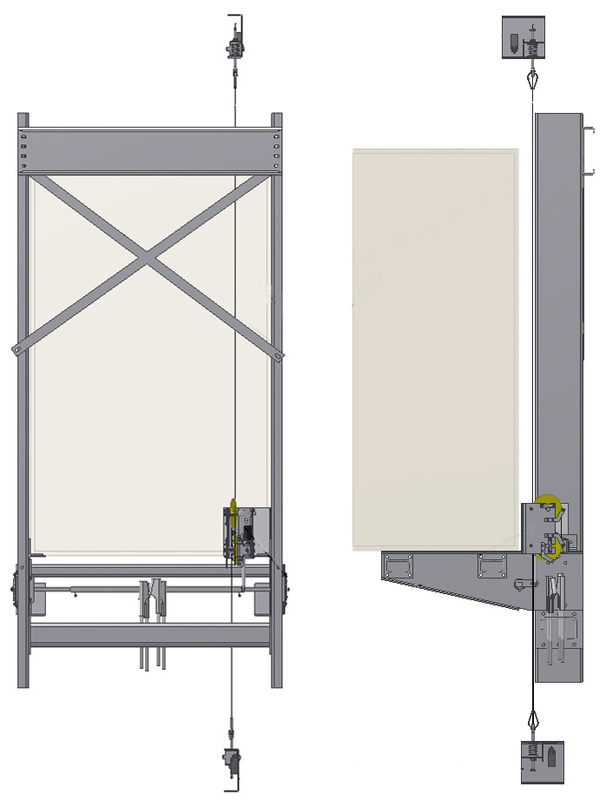 As an illustration, the following video shows the update of an existing lift with our RENO system. For further information, please consult the product page on our website. 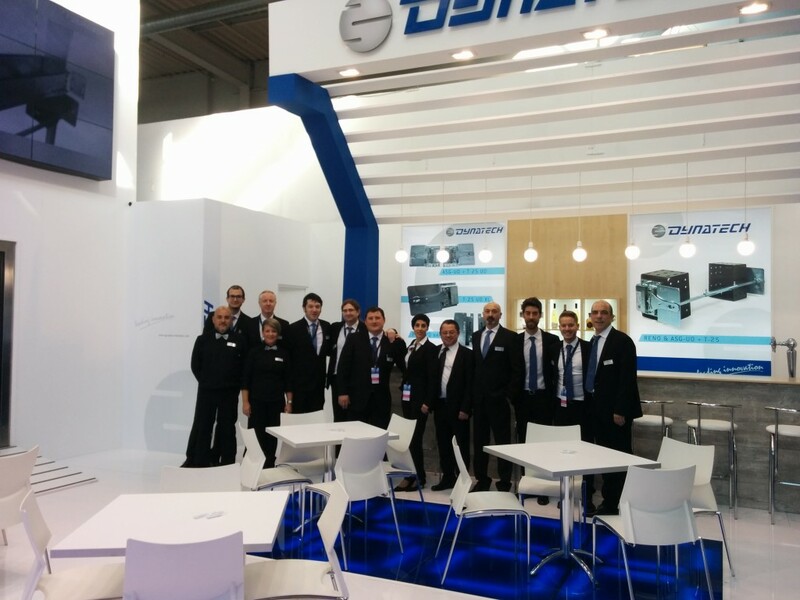 Dynatech would like to sincerely thank all of the visitors who came by our stand during INTERLIFT 2015. Our initial objective was to create a special work atmosphere where technical topics related to products could be discussed in a beneficial manner but that, at the same time, would allow for enjoyment and entertainment. In looking at the results, we believe that this objective was fully met. Just one figure: 960 people enjoyed our simulator show in the four days that the fair lasted. We are sure that everyone who visited has received ample information on our current products and on the new items that were presented and we also hope that you have enjoyed the show in the simulator as well as the 3D stereoscopic videos, the 2D videos and the special selection of Spanish cuisine that we brought for the event. If you would like, you may send us your valuable opinions through our blog, we would be very grateful. Now having returned to our daily routines, we are continuing to develop new products and are also thinking about new ways to surprise you at the next INTERLIFT. Did someone say that business exhibitions were exhausting and boring? DYNATECH would like to offer you something different for a change. 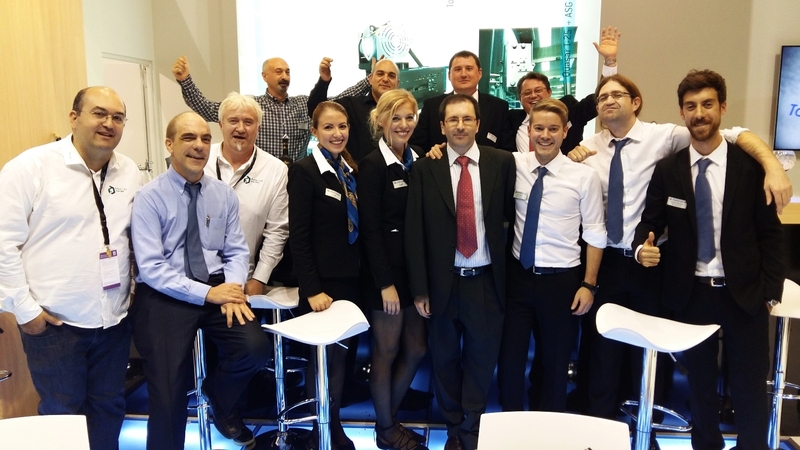 If you have a chance to go to this year’s INTERLIFT exhibition, take the opportunity to visit us at stand 7144 in Pavilion 7. There you’ll find lots of products, new developments and, above all, excitement and enjoyment. We hope your visit will be an experience to remember. 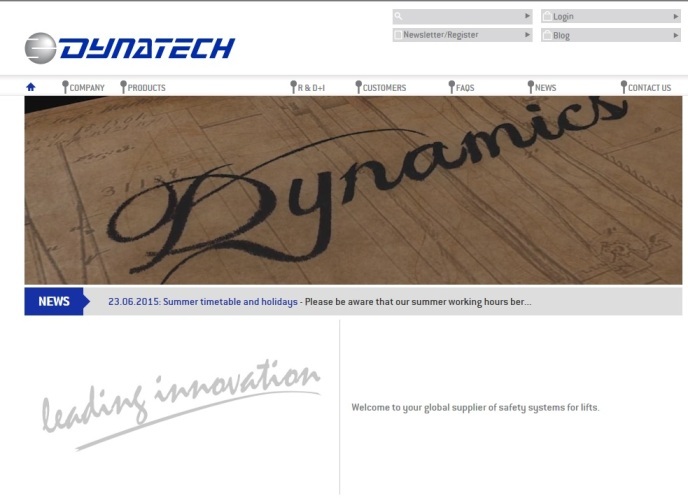 Dynatech has the pleasure to announce that on June 30 it will update its current web page with a much more complete and useful version. There will be a corporate video translated into 6 languages showing who Dynatech are and what we do. We are confident that the information presented in this video will be very useful for all those customers who have not yet had the opportunity to visit us, who may know our products but nothing about our company. We hope this new information tool will be to your liking; we will be constantly working on it to expand and improve it. We also urge you to please send us any suggestions you may have regarding our website or any other issue. Your opinion is very valuable to us. 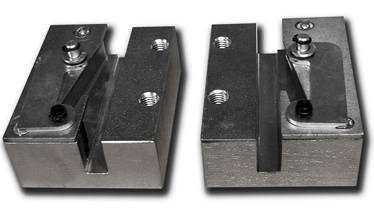 Dynatech has recently certified its 200 and 300 tension weights with just 1 mass for use with the one-way (descent only) versions of the LBD-200, VEGA and LBD-300 governors. Thanks to this, we have been able to considerably reduce the weight of the tension weights in these cases, as well as their price. Please consult their updated price in the customers’ area of our website for this and other news. This system is formed by two supports or braces that are attached to the new design or existing (renewed) frame. The system acts as support for all Dynatech progressive safety gear, as well as its associated linkage. Adaptability for the installation of the most common slide or roller guide shoes sold commercial has also been foreseen. 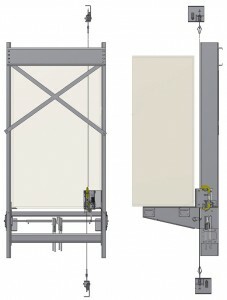 Dynatech has taken the versatility of the RENO support system to its extreme, as it has been designed to include our QUASAR T25 governor that involves an unequalled leap in quality in the Market: This solution allows for the updating of not only the frame but also the entire lift in terms of safety, leading to significant savings for those wishing to renew an installation, thanks to a one-piece safety unit (safety gear + governor). Important note: Please be reminded that Dynatech offers the D-BOX electronics for the full updating of a lift with UCM (A3) control, even in the case of old installations. Please visit the UCM solutions section of our website for further information. Dynatech has tested the rigidity of the RENO system in freefall and under the strictest and most demanding conditions possible, thus guaranteeing its reliability. In turn, the installation different options available allow for different support widths, providing great adaptability for the complex diversity of frames. Safety gear: The entire range of PR, PQ and ASG progressives, with their associated linkage T1, T2, T3, T25 and T25 UD. 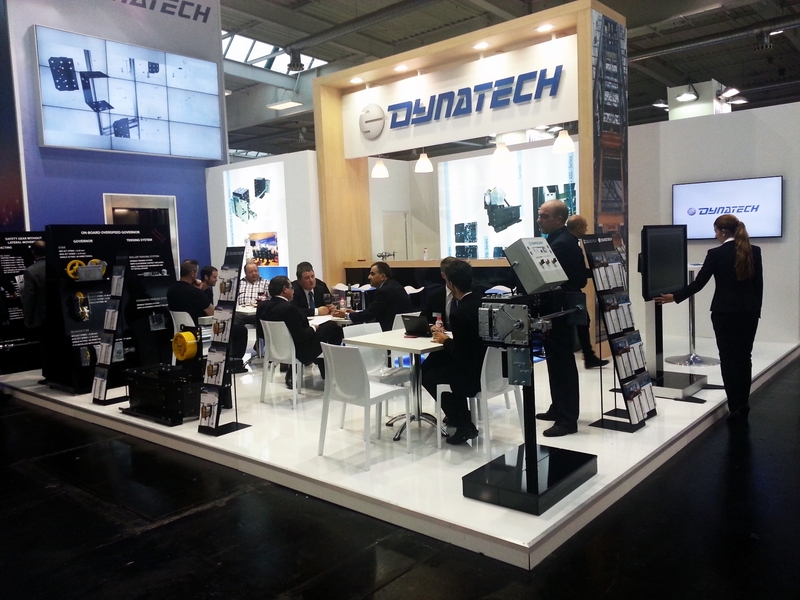 Dynatech has just approved the new safety gear for the high-speed ASG-221 (unidirectional) and ASG-221 UD (bidirectional). The maximum tripping speed is 3.9m/s and is used in machined, dry guide rails. The maximum allowable P+Q in both safety gears is 3.284kg, but can reach up to 6,500kg if the TANDEM system is used. We would like to inform you that Dynatech has released an update to its T-25 driving bar, which is used together with the ASG type unidirectional safety gear; it is called the T-25 v2. As this driving bar is delivered pre-assembled with the safety gear, there will be no difference in its use, and its functionality of course is also guaranteed. The only difference for the installer, which is an advantage, is that you will not need to install the tension springs packet, required up till now, as this function will be performed by the incorporated torque spring. The new version is in fact very similar to the T-25UD version. Difference between T-25 and T-25v2 click here. Difference between T-25 UD and T-25v2 click here. As you well know, the extended use of e-mail has led to the spread of a large amount of unsolicited e-mail (SPAM) that is continuously circulating the internet. To avoid the growth of SPAM, all e-mail service providers must take measures to prevent this problem and establish controls (filters) on all e-mails before they are delivered to their client. Given that SPAM is increasingly sophisticated, they pass through these filters very easily in a short period and, therefore, e-mail providers are permanently adapting and changing these filters. SPAM is treated in a very similar manner to a virus in the internet and, therefore, is automatically blocked and deleted without the knowledge of the sender or the recipient. Were this not the case, we would receive the same number of notifications as potential SPAM and this would also be very inconvenient. In short, the recipient to whom an e-mail detected as SPAM is addressed will not receive an e-mail or notification of it being blocked and the e-mail is directly lost. Given that SPAM is treated as a virus, when someone sends an e-mail that is detected as SPAM, they will not receive a notification to indicate that the e-mail sent has been blocked and deleted. The constant changes made to Anti-SPAM filters have the disadvantage of being able to affect any internet users. It may well be that an e-mail is sent from a reliable account, such as yours or ours that are not SPAM, but is identified and deleted as if it were SPAM. Over the past week alone we have detected 3 cases of this type of e-mail sent by our customers that have been deleted, with the further difficulty that neither they nor we have received an e-mail to inform of this problem. e-mails with a lot of links (to websites) are considered potentially hazardous. Some e-mail addresses that have a relatively uncommon classification or, primarily, addresses from web-based providers such as @gmail.com @hotmail.com @yahoo.com or any other local service provider. These involve greater risks because an indeterminate number of accounts can be created and, therefore, almost all SPAM comes from these public providers. If you want to avoid this problem in the future, we recommend you use the ‘Delivery Confirmation’ tool as prevention for complete security. By using this delivery option, you will receive notification when the e-mail ‘passes the filter’ and is delivered to Dynatech. The most well-known tool: ‘Request a Read Receipt’ is a useful tool as well, but only if the e-mail has been received by the addressee. New prices for the D-BOX. Now much more competitive! Thanks to our customers’ great acceptance of our D-BOX electronics, Dynatech has been able to cut their production costs by a huge amount. This reduction will be included in the new price list applicable as of 1st February. Certification of our products in accordance with Standards: EN-81:20 and EN-81:50. As you probably know, there is to be a significant change in the standards applied in our lift sector. The current EN-81:1 2001 + A3 and EN-81:2 2001 + A3 are to be replaced by EN-81:20 and EN-81:50. 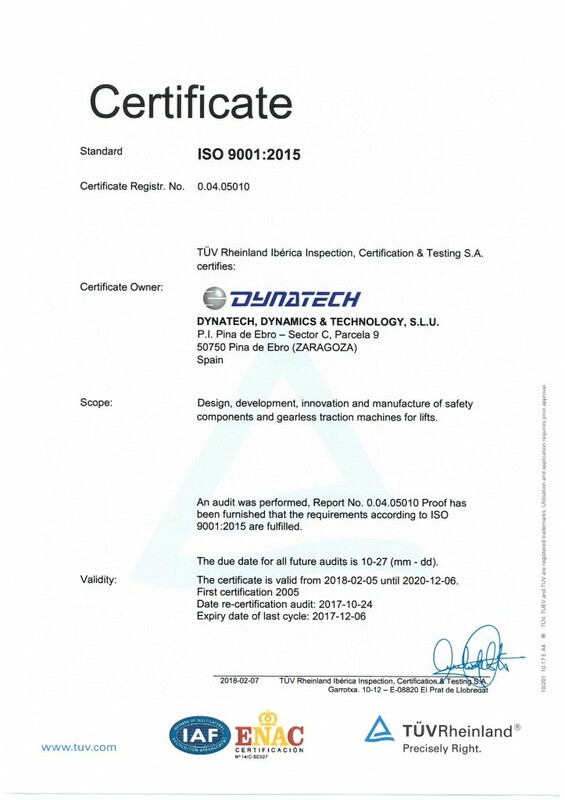 In order to solve any doubts our customers may have regarding the way in which this change will affect our products, Dynatech has carefully studied the new standards and has also contacted the notified Bodies. 1. The new standards are to come into force as of late October 2014 in the EU and will undergo the translation and validation process in each country until around March 2015. 2. The former Standards will remain valid until 31st August 2017 and, therefore, both Standards will coexist for over 2 years. 3. No new certificate can be issued and the current certificates cannot be modified according to the new Standards until they have been validated in each country, in this case Spain. 4. None of our SAFETY GEARS will be affected by this change, as they are fully compliant with Standard EN-81-20 and EN-81-50. All that is required is an extension of the current certificates, which will be possible as of March 2015. 5. The same applies to our STAR, VEGA and QUASAR speed governors in all of their versions. 6. The LBD-300 governor will have to be redesigned. This is because the new Regulation requires a shorter distance between the interlock points and, therefore, the number of interlock points must be increased. Dynatech is already designing the new model to replace the LBD-300. This must then be validated and certified in line with the new Standards. This new certification will be available as of late 2015. 7. The LBD-200 governor has the same disadvantage. In this case, we have decided to keep the same design for countries outside the EU only, i.e. countries with ASME influence. It will be completely replaced in the EU by the VEGA governor, as this also has a diameter of 200 mm and covers the entire range of speeds, even more than the LBD-200. Furthermore, it is already fully compliant with the new Standards, as explained above. 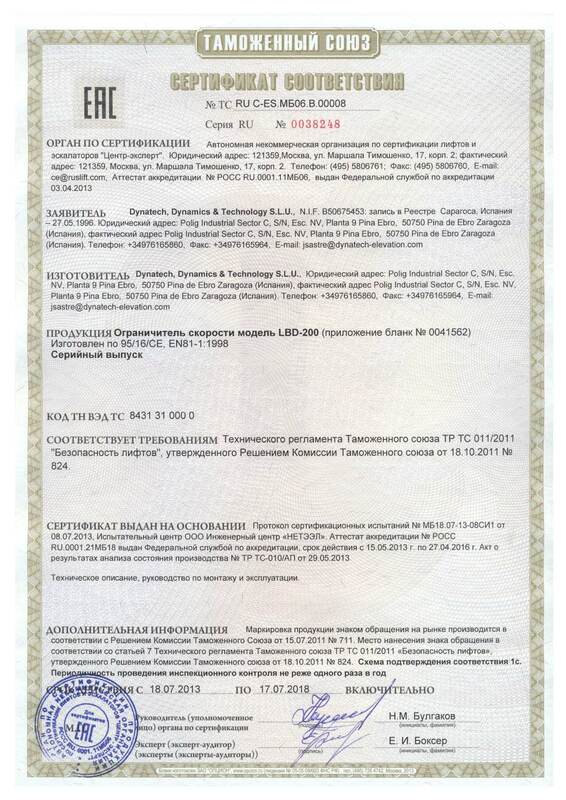 Dynatech is pleased to inform you that our Russian certificate for Progressive safety gears PR-2000-UD, PQ-4000-UD, ASG-100-UD, ASG-120-UD and PR-2500-UD has been renewed, according to the Customs Union’s TP-TC-011/2011 technical requirements, and is valid for: Russia, Belarus and Kazakhstan. As soon as we receive the certificates for the rest of the safety gears we will let you know. We remind you that our Russian certifications for the STAR, VEGA and LBD-200 Overspeed governors have already been renewed in accordance with the technical requirements from the Customs Union TP-TC-011/2011, and are valid for: Russia, Belarus and Kazakhstan. In 2009 Dynatech created a new technical development department, independent from our R&D department for safety components: The Integration Laboratory. The purpose of this new department was, and still is, the technological development of new projects that are not connected with the company’s main product, whether they were started by Dynatech or originated from collaborations with other companies, research centres, technological institutes, etc. It had a double purpose: On one hand, Dynatech had the opportunity to diversify its technological activities in sectors outside of the lift industry, which, therefore, implied the possibility of developing an industrial product and even participating in its subsequent industrialisation process, given that Dynatech has been involved in this process since its conception. On the other hand, working in multidisciplinary environments with so many diverse applications and technologies allowed Dynatech to take advantage of knowledge and techniques, not from our sector, that can be applied to current and future products, in a constantly improving benchmarking process. The results of this initiative, among others not mentioned, have been the collaboration and the provision of solutions to companies such as EADS (see related news story), the development of a hydrogen vehicle with other companies and research centres (see related news story), Dynatech’s design for a vertical axis wind turbine, which has made a lot of progress but is still in development (see related video), etc. At present, apart from other on-going projects, we would like to highlight that our Integration Department is collaborating with the “Group of Thermal Properties of Materials” from the Materials Science Institute of Aragon (Spanish National Research Council –CSIC (for its Spanish abbreviation)-, the University of Zaragoza –UNIZAR (for its Spanish abbreviation)-) and the University of Zaragoza’s Condensed Matter Physics Department, to create a test bench for a magnetic refrigeration system, to be used in a lab, which incorporates Halbach permanent magnet rotors. 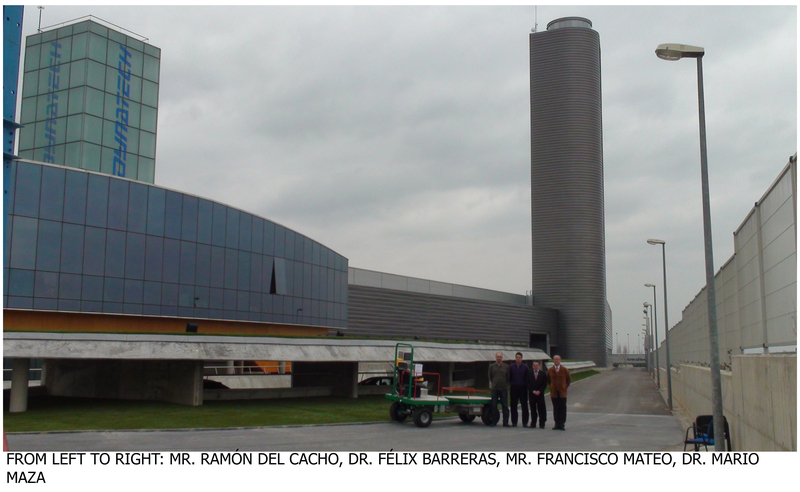 This project is coordinated by professors Mr Ramón Burriel and Mr Elías Palacios. Mr David Velázquez and Mr Jesús Beltrán, the collaborating engineers, monitor the project, perform the simulations and process the results. Mr Ramón del Cacho, from Dynatech, is the support technician for kinematics and control. This project, of great technological contribution, is backed by BSH (Bosch Siemens Hausgeräte). 100% customer care, service and information in real time. Become a Dynatech customer and you will have better customer care and complete information on the current products, new developments, technical support, conditions of sale and a lot more by using our customer area. Previously, our website provided a great deal of information; however, it may have been too excessive to be accessible to visitors. Finally, Dynatech has decided to set limits to this information, given the mandatory discretion necessary for any company that is constantly working on R&D. Furthermore, the company has undergone an important improvement process as far as customer care and service are concerned. The new customer area in our website will allow you to be up to date, to the slightest detail and in real time, in everything that may be of interest to you. Nobody but You deserves a customised quality service. Should you not have requested your username and password yet, do it right away and start enjoying a greater number of advantages. 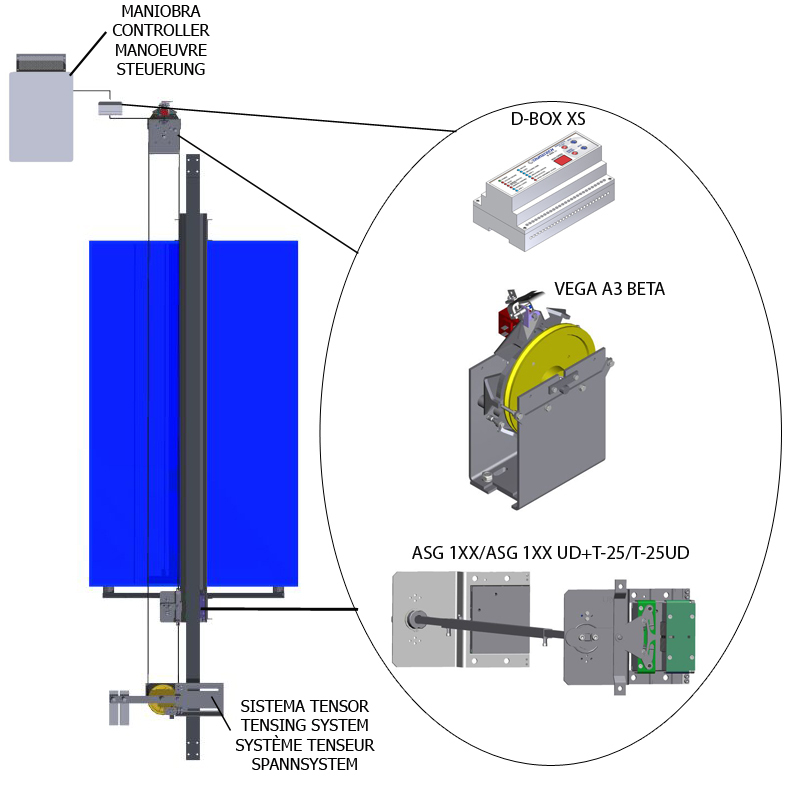 STAR and VEGA overspeed governors have been certified in accordance with the TP-TC 011/2011 Standard. Dynatech is pleased to inform you that the Russian certification for STAR and VEGA Overspeed governors has been renewed in accordance with the TP-TC-011/2011 technical requirements from the Customs Union, valid for Russia, Byelorussia and Kazakhstan. The new certificates that are in accordance with TP-TC-011/2011 will soon be available for our range of Progressive Safety gears, even though the current certificates are still valid until the end of 2014. The new DOCUMENTATION AREA is now available in our Customer Area. A user name and password, already supplied to most of you earlier, is required in order to access the referred Customer area for the first time. Once you have accessed it, you should change your password to one of your choice, something easy to remember. We have noticed that many customers have not accessed the area yet. Should any user have lost the e-mail sent to them, including his/her username and password, or should they wish to register, please send an e-mail to this address, support@dynatech-elevation.com, and we will send you a new username and password. 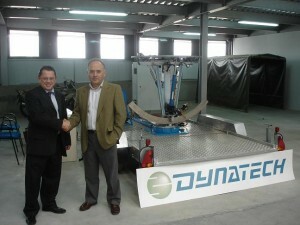 GSS: New software developed by Dynatech to select TORNADO gearless machines. It is more powerful and complete than the previous software. News: This section displays all the news edited, either by date or label: Expeditions, products, certificates, holiday closures, etc. 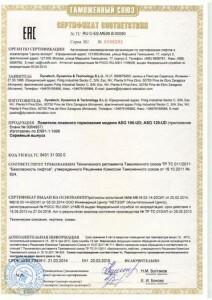 Documents: In this section, you may download any document you require at any time: Instructions for Use and Maintenance, Certificates for: Standardisation, from the Quality System and the Directive on Lifts, documents from Notified Bodies, specific Drawings, Videos, Manuals for replacing components, etc. The structure of this section will make quick searches for documents easier. On the other hand, we would like to highlight that every time we modify a Manual, Certificate… or a new Document is added to that area, which concerns you, you will receive an e-mail informing you of this change; therefore, you will be duly informed in real time of any change made in our product’s Documentation. After this step, in the following days, we will replace most of the documentation available on our website, as you know, so that you will have to access the referred Customer Area in order to access and download the documentation. That is the reason why, in your own interest, we recommend that you register or request to register for that Area soon. -Before continuing reading the following explanation, please read the UCM section included in the governors’ manuals where the anti-creep system’s functioning is explained. Note: Managing the anti-creep system has to do with the warnings specified in the governor’s manual (UCM section). The LBD-200 speed governor has been certified according to the Russian GOST R Standards. Dynatech is pleased to announce the Russian certification of the LBD-200 speed governor in line with Standards GOST R 53780-2010 and GOST R 53781-2010. This governor now joins the already extensive range of products certified under this standard. 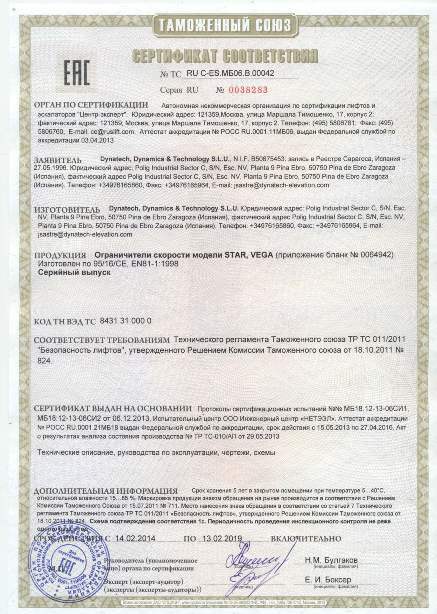 As can be seen in this certificate, it refers to the meeting of technical requirements according to Customs Union TP-TC-011/2011 between Russia, Belarus and Kazakhstan. We would like to take this opportunity to inform you that the GOST certificates for all other products remain fully valid until their expiry date, despite the TP-TC-011/2011 not being specified in the text of these certificates, as they were issued prior to the agreement between the states. In short, all of our products with GOST certification meet TP-TC-011/2011 requirements and, therefore, can be sold, installed and used without any problems or obstacles in the member states of this Customs Union. WOULD YOU LIKE TO SEE AND TRY OUR PRODUCTS? A friend has sent us an illustrative photo of the unstoppable technical evolution in production. We have managed to reduce the size of those huge governors from decades ago to the smallest size possible without changing their performance. Thank you very much for the photo, Fede! Please be advised that our products are to include an additional feature from now on. We have added a QR code along with the labels attached to the product that show its characteristics. 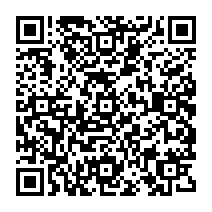 You scan this code using your smartphone and the product will be displayed on the screen of your mobile phone directly from our website in the language it was requested. You can, however, change the language if required at the top of our site. We believe that this new application may be of help to you, to the fitter and even to any inspection body that requires instant information on the product and wishes to read its instructions for use and handling, for example if the manuals have been lost or for any other reason. As you know, there are free apps that you can download to your smartphone in order to be able to scan these codes. We hope this new feature is of interest, as well as being useful, and do not hesitate to contact us with any queries. New Tensing Pulleys COMPACT 120 and 200. COMPACT tensing pulley is a product designed to provide the tension required for the rope going through a standard governor’s groove. 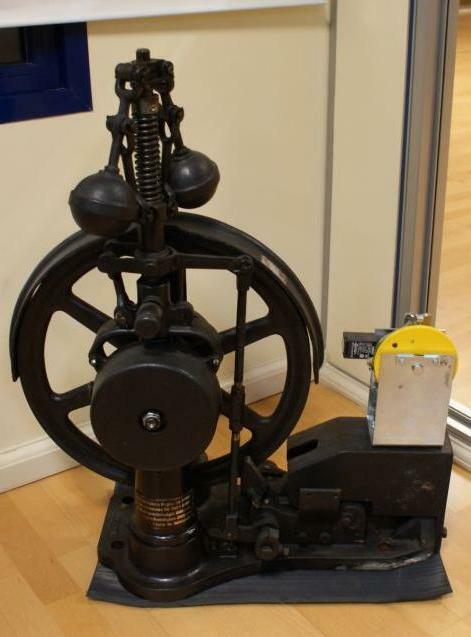 Unlike the usual tensing pulleys, which use masses to generate tension, these masses have been removed from our COMPACT pulleys replacing them with springs. This is a very compact design, with minimum dimensions, perfect to be used in installations with a reduced headroom and pit. DYNATECH’s COMPACT tensing pulley is a product that is supplied pre-assembled. This allows the installer to save time when assembling it in the installation. It is supplied with a de-tensioning contact and with a rope tensioner that will make rope re-tensioning easier if required. QUASAR overspeed governor, in its standard version, is made up of a governor of greatly reduced size but with excellent features. 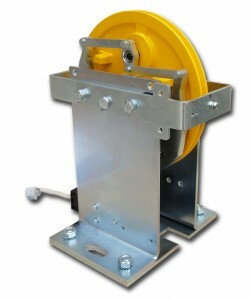 It incorporates a pulley of Ø120mm to be used along with a Ø4mm steel rope. 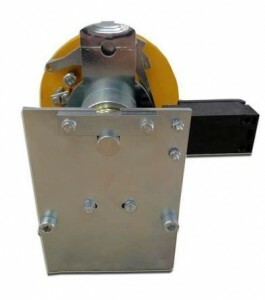 This pulley is supplied with a hardened groove by default, which provides it with great durability. Furthermore, the rope used has very little elongation, thus shortening maintenance intervals to a minimum. Speed range is very wide, ranging from a rated speed of 0.1m/s to a maximum speed of 2.18 m/s. This is the first governor designed by DYNATECH reaching a minimum tripping speed of 0.3m/s. Its reduced size and compactness make it perfect to be fitted in a lift’s shaft without machine room, since it requires little space. So far, Dynatech is only selling it in its unidirectional version; however, we are working to offer it in its bidirectional version in the near future. The unit’s specification, its manuals for use as well as its Certificates are already available in the Product section in our Website. 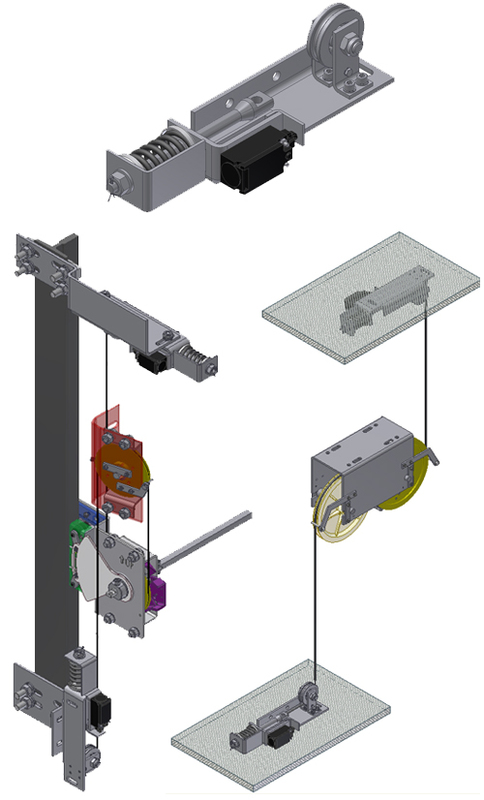 New Diagram for the Implementation of the EN 81-1/2:1998+A3:2009 (UCM) Standards with our new products. OVERSPEED GOVERNOR LBD-300: NEW OPERATING AND MAINTENANCE INSTRUCTIONS IN ACCORDANCE WITH ADDENDUM 3 AVAILABLE IN OUR WEBSITE. 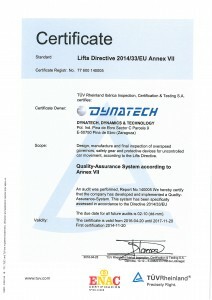 We inform you that Dynatech has been awarded with the Certification of the LBD-300 Overspeed Governor in accordance with the EN 81-1/2:1998 + A3:2009 Standard. The product’s specification, its manuals for use as well as its Certificates are already available in the Products section in our Website. built in the overspeed governor. The unit’s specification, its manuals for use as well as its Certificates are already available in the Products section in our Website. 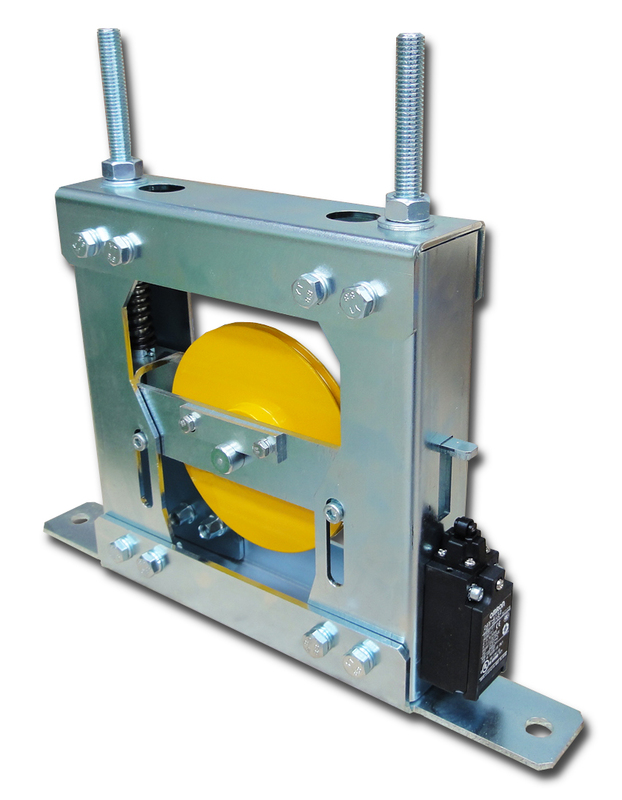 Our entire range of progressive safety gears may be installed in Tandem configuration. 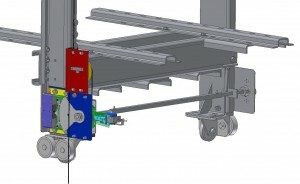 Tandem configuration consists of fitting two units of safety gears into the frame instead of a single one, as usual. 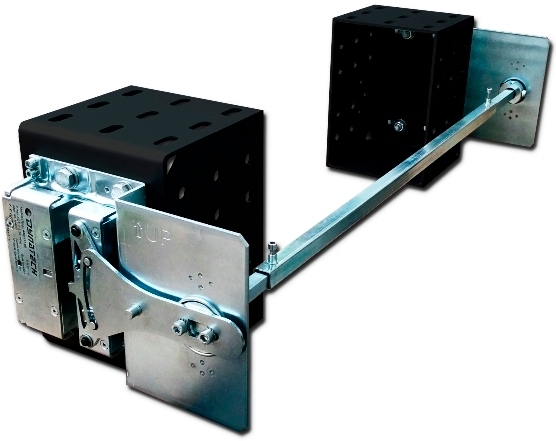 This configuration allows doubling the range of the total mass (P+Q) the safety gears may brake, and is valid for the entire range of interlocking rails in Dynatech’s driving bars. 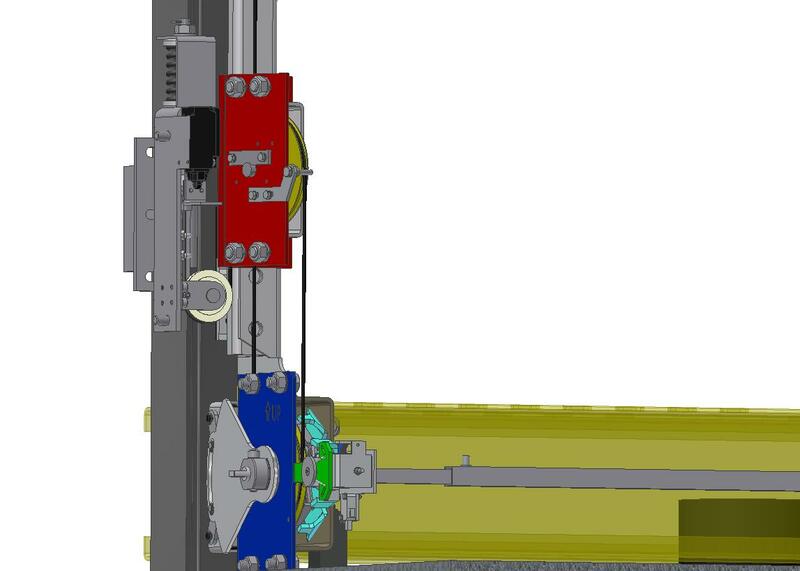 In order to make the assembly and use of Tandem configuration easier, Dynatech designed a system based on the ASG safety gears and their T25 driving bars, both in unidirectional and bidirectional versions. 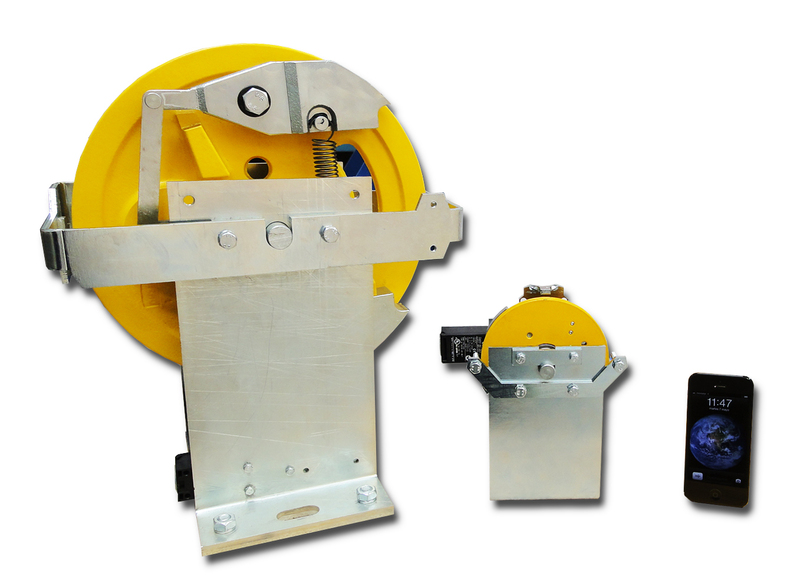 This system has the advantage that only requires a single driving bar shaft. For the system to operate correctly, it is important that the frame manufacturer observes the distances included in the manual for use and maintenance. There is no pre-set system or configuration for the rest of the Dynatech’s progressive safety gear range, the customer being responsible for fitting the system and manufacturing any element required for its correct operation. Dynatech has checked the reliability of the Tandem configuration in the entire range of progressive safety gears by making free fall tests in accordance with the official standardisation criteria. Dynatech hereby informs you that a new service is to be enabled on its website in the following days: The Customer Area. This service aims at providing you with a better and more customised attention. To access the customer area, the user name and password we will provide you to access for the first time, will be required; however, once you have accessed, the password is to be changed by another of your choice, one that is easier to remember. Rates: Here you may find the prices of the products according to the conditions you have negotiated with Dynatech. Any new product will be added without requiring to send you a new list. The list will continue to be interactive, displaying full information on the product if you require so, by just clicking on the product name. 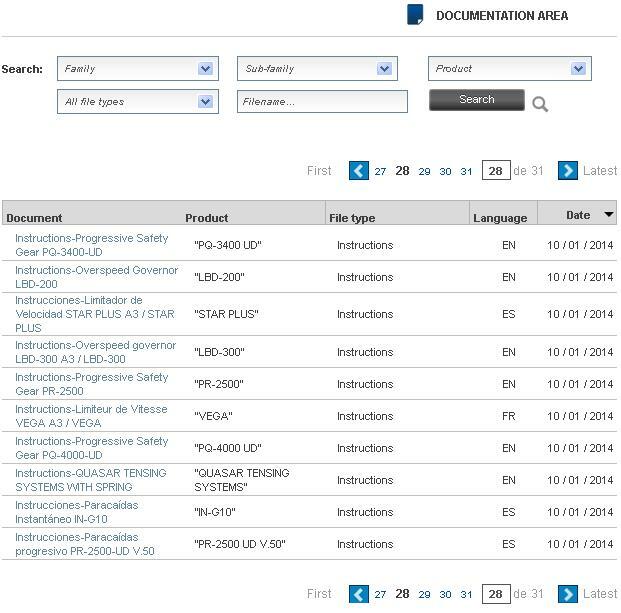 Documents: In this section, you may download any document you require at all times: Certificates of standardisation, quality system, Directive on Lifts, documents from the Notified Bodies, specific Drawings, Videos, Manuals to replace components, etc. The structure of this section will make your fast search for a document easier. Technical Queries: Just select the type of component your query refers to and enter the content of the query, so that the system directly sends your communication to the Dynatech person specialising in that product. Response will be much quicker this way. 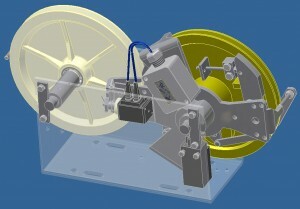 GSS: Dynatech has developed new software to select TORNADO gearless machines. It is more powerful and complete than the previous one. Orders: In this section, you may select the products you require and directly send the orders, if you wish to use this process. The system will guide you in the selection and assist you at all times in order to prevent the lack of data or errors in the combinations of particular components, which usually causes a great waste of time in order processing as well as a risk of selecting the incorrect product. In the case of machines, it will be linked to the prior compliance with the report from the GSS. 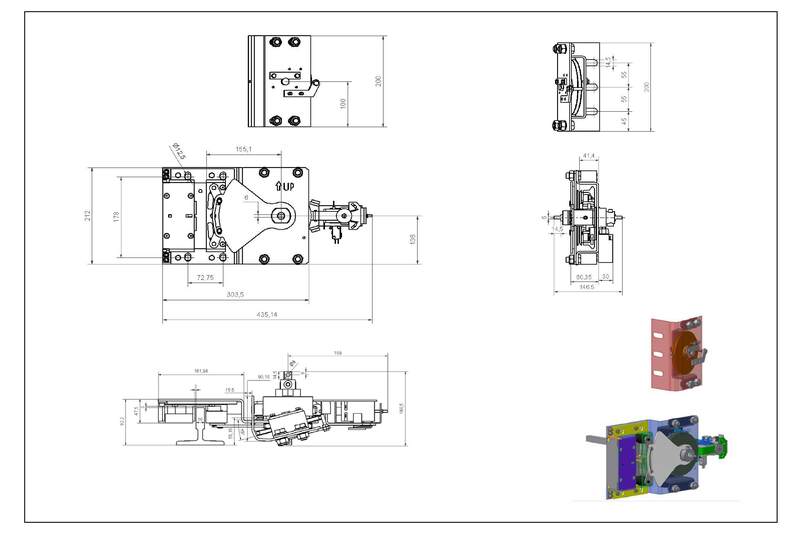 You can always save a copy of the orders placed as well as of the technical reports of the machine selection. News: This section displays all the news edited, either per date or label: Expeditions, products, certificates, holiday closures, etc. Latest news: Every time a new piece of news is broadcasted, it will be personally received by you in this section, so that all the news, since the last time you accessed the customer area, will be displayed. My account: In this section you may change either your user name or password to access this service, as well as the rest of data connected to your account. Please bear in mind the natural mobility of people within the companies they work for. For your own security, it is recommended to change the password the moment the user changes or is no longer professionally linked with your company. 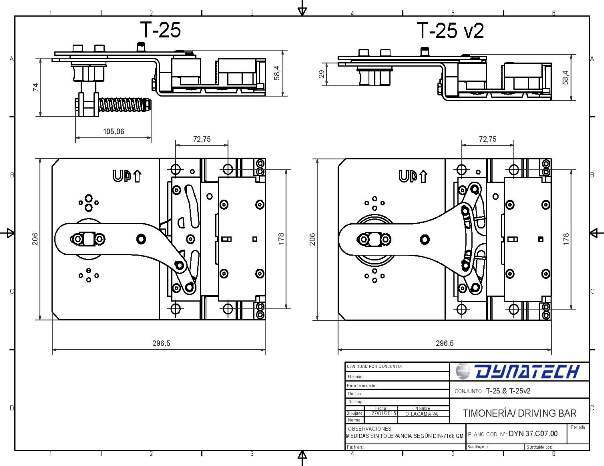 Throughout this week, this new section will be enabled on our website; at first, only with the Tornado Gearless Machine selection (GSS) program. The rest of the above-mentioned modules will be gradually added and you will be duly informed about it. In short, you will also receive an e-mail informing you about all the e-mail addresses within your company to which access to this area will be directly assigned by default, to which user name and password will be sent, so that you may be aware of it and in case you wish some of the addresses not to have access, or the address is no longer available, etc. Finally, you will individually receive another e-mail including your user name and password. 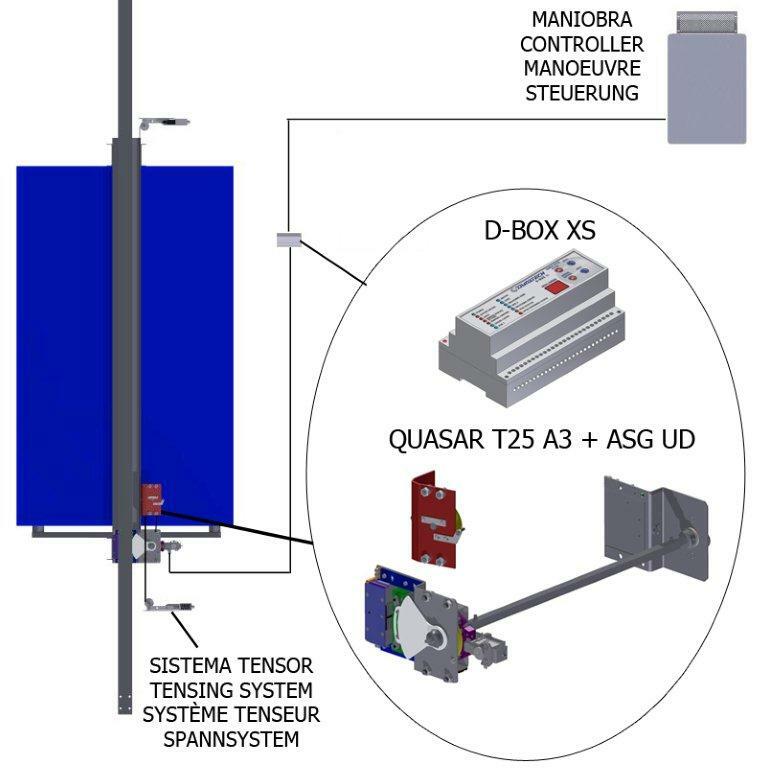 Dynatech has designed a new rope tensioner system to be used in the STAR, QUASAR T25 and QUASAR SV governors. 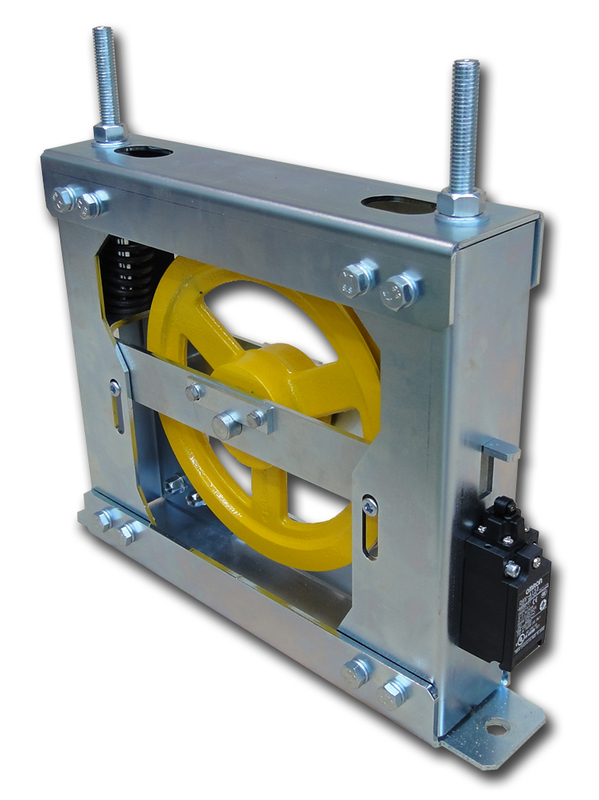 The ROLLER tensioner system accepts rope diameters of 4 and 6 mm. The information on this new product is already available on our Website. The QUASAR T25 overspeed governor is one of the three models in the QUASAR governors’ range. 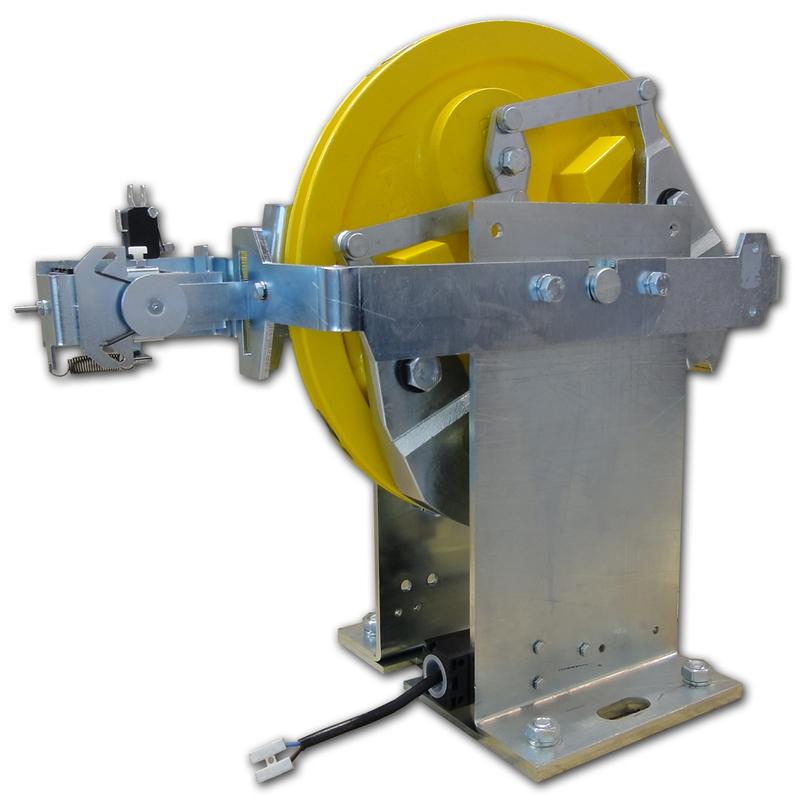 It is an on board overspeed governor with a pulley of Ø120mm to be used with a steel rope of Ø4mm. 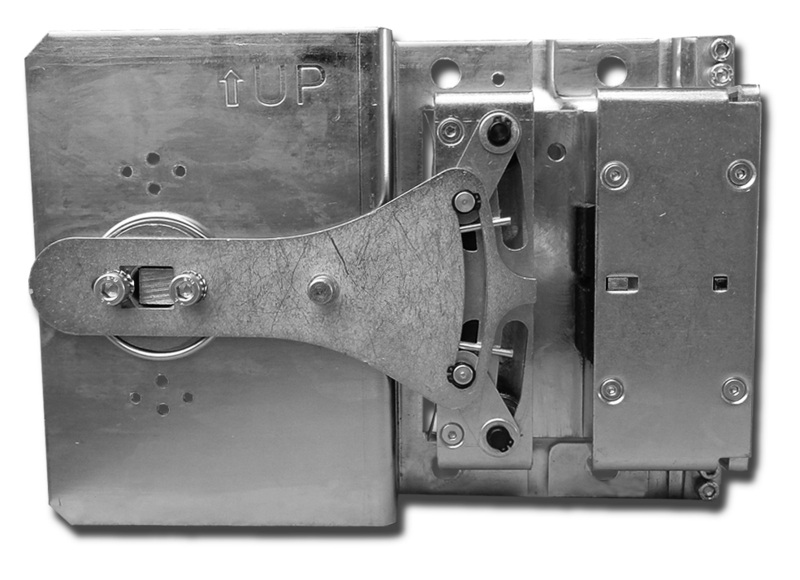 This small governor is assembled onto the T25 steering mechanism where, in turn, ASG progressive safety gear is installed; that is to say, Dynatech presents a safety unit made up of governor and safety gear “in a single part”. The combination of the advanced ASG safety gear’s performance and that of the QUASAR governor allows covering most of the lift installations and, therefore, the customer does not require combining different types of safety gears with different types of governors. 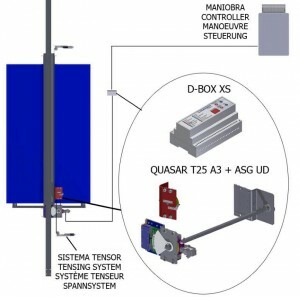 QUASAR T25 along with the ASG provides a global solution in a single product. Its compactness and size allow it to optimally adapt in the case of lifts with reduced pit and/or headroom. 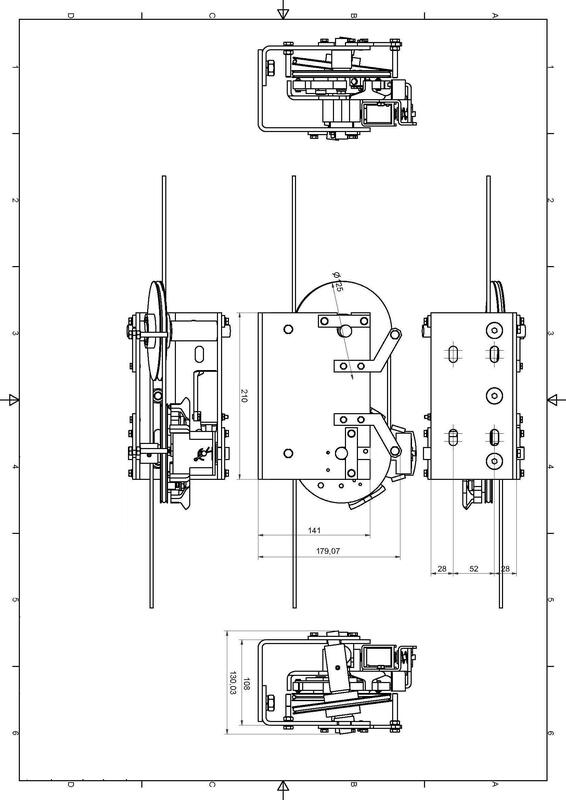 It is remarkably versatile since it may be installed in lifts with a frame of the gantry or cantilever type as well as with the guide rails in the normal or reverse position. 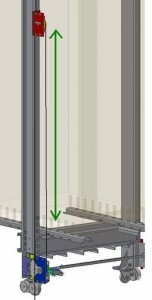 It can also be attached to an already installed frame and, therefore, an old lift may be updated to the new safety standards at a low cost. 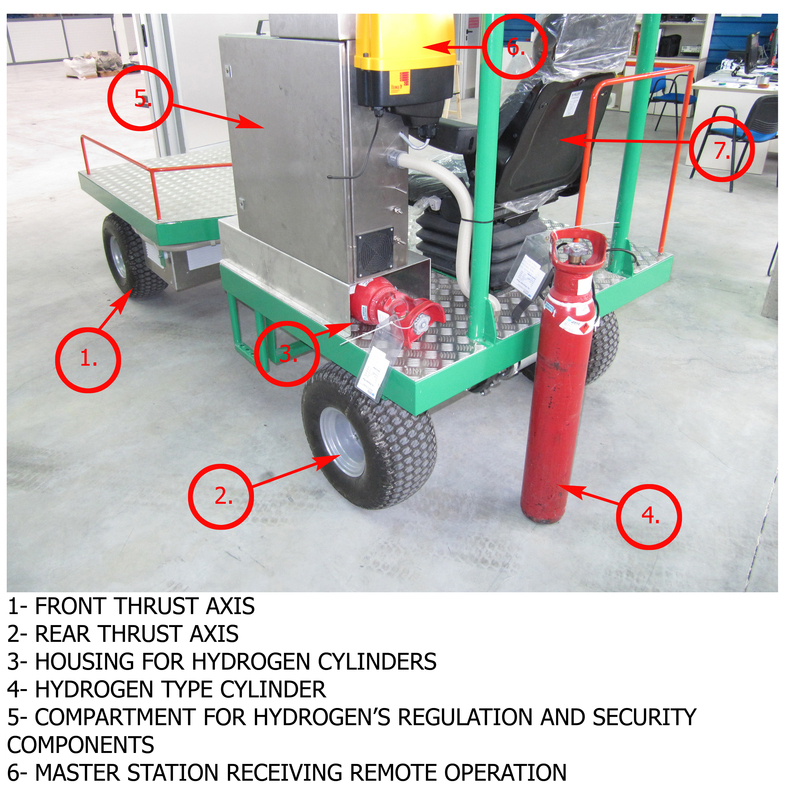 As you know, Dynatech considers that A3′s UCM must be ensured in the safety components, since if performed using the drive machine brakes, even though the Standard allows it in case of sliding of the suspension ropes, the UCM will not be prevented. 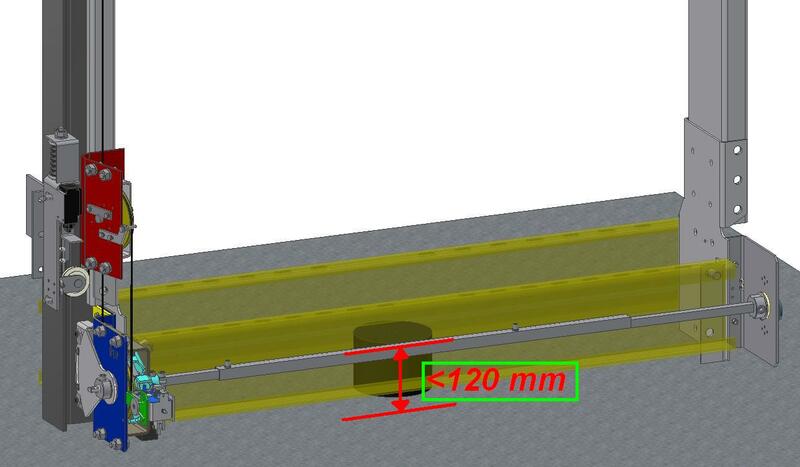 Thanks to the small size of the QUASAR’s Governor pulley, we have achieved an ultrafast tripping in the case of a UCM, almost as if it were a car’s parking brake, therefore, safety is ensured at all times. Dynatech is at your disposal to advise you on the best use of this new product with specific solutions for your lift, no matter if it is standard, of reduced pit, large P+Q, etc. Example of use in reduced pits. The installation of split guide shoes above the safety gears is highly recommended. Photo 6. Minimum space required. Due to the serious financial crisis in Spain, the amount of people going to community kitchens, shelters and charity centres has increased alarmingly. With the aim of alleviating the unprivileged people’s needs somehow, Dynatech has donated 1,2 tonnes of non-perishable food to the Pina de Ebro City Council, which will be shared by the City Council’s community kitchen and Charity Organization CARITAS. We inform you that our IN-3000 Instantaneous Safety Gear has also been approved for Machined Guide Rails with a thickness of 9 mm. We have modified all the information corresponding to this product in the data sheet on our website, as well as in the manuals for use and maintenance in all the languages. Please click here to go to the product’s data sheet on our website. QUASAR SV Overspeed Governor is already available in our web site. The QUASAR SV overspeed governor is one of the three models in the QUASAR governors’ range. This is an on board overspeed governor with a 120mm-diametre pulley, very similar to our STAR overspeed governor but much more adjustable than it, according to the room available in the frame, given its smaller size. 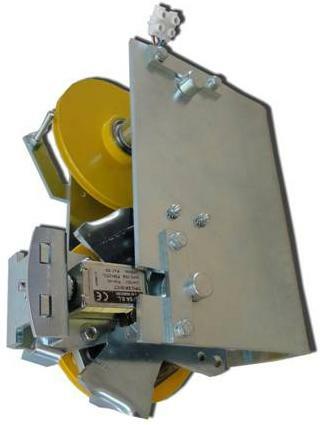 It is a small governor with a 120mm-pulley diameter to be initially used with a 4mm-steel rope. Dynatech intends to continue developing this governor to improve its features as well as to be used with other type of ropes. As soon as any further improvement in its use is achieved, we will let you know. Thanks to the small pulley used, a STAR governor has been obtained but with a much smaller size. It is perfect for cantilever-type lifts. It incorporates a remote or anti-creep interlocking system that can also perform the remote tripping function at the same time. The drawings and pictures of the product are provided below. A real gem. Along with ASG safety gears, which exceed 4000 Kg of P+Q, both safety gear and governor are combined in a single part. The resulting safety unit has a very small and compact size and, thus, it may be suitably used in reduced pits, since the space required is below 120 mm, if fitted at the bottom of the frame. 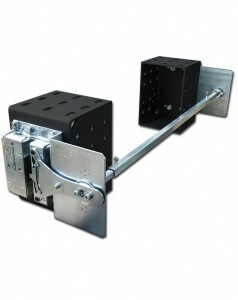 Furthermore, the system is ready to be used in guide rails both in standard and reversed position. 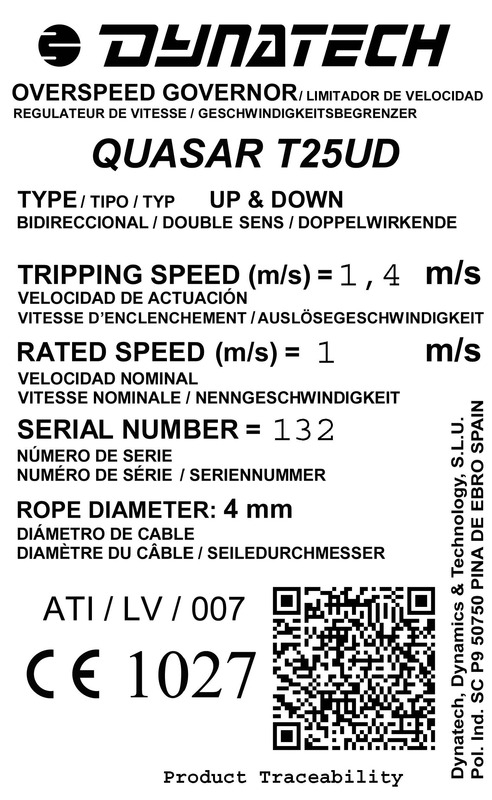 As can be seen, the number of combinations of the different safety elements to cover the same scope of application can be reduced thanks to QUASAR T25, along with ASG safety gear’s features. Therefore, if our customer chooses this system, lower manufacturing costs are guaranteed. As in model SV, you can choose between the remote or anti-creep tripping systems. You will receive the price list including the new products soon. 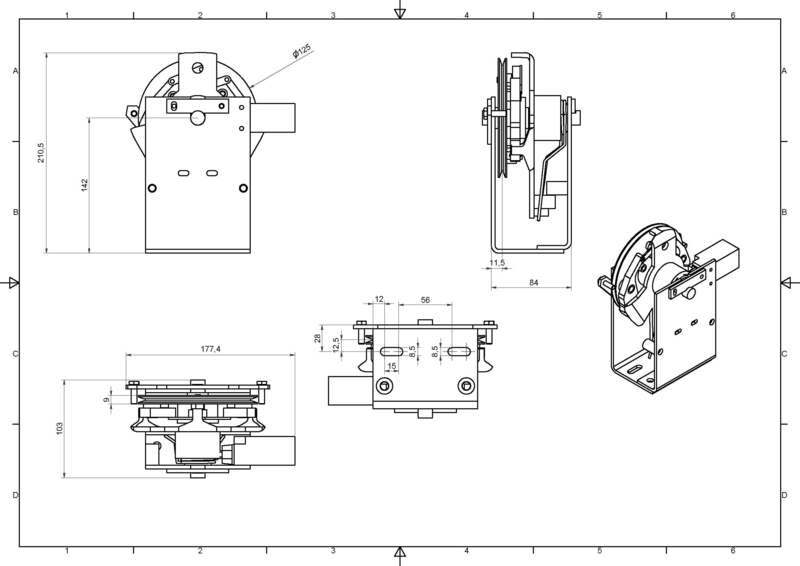 The operating and maintenance instructions for UCM UNIT: D-Box + VEGA + ASG+T-25 have been modified. The operating and maintenance instructions for UCM UNIT: D-Box + VEGA + ASG+T-25 have been modified in French, English, Spanish and German. They are now available on our website. 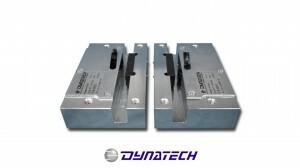 Dynatech will start supplying its new model of D-BOX Device for UCM in the next deliveries. The main difference from the previous model is that the 24V-Battery in the previous models has been replaced with a new 12V one. 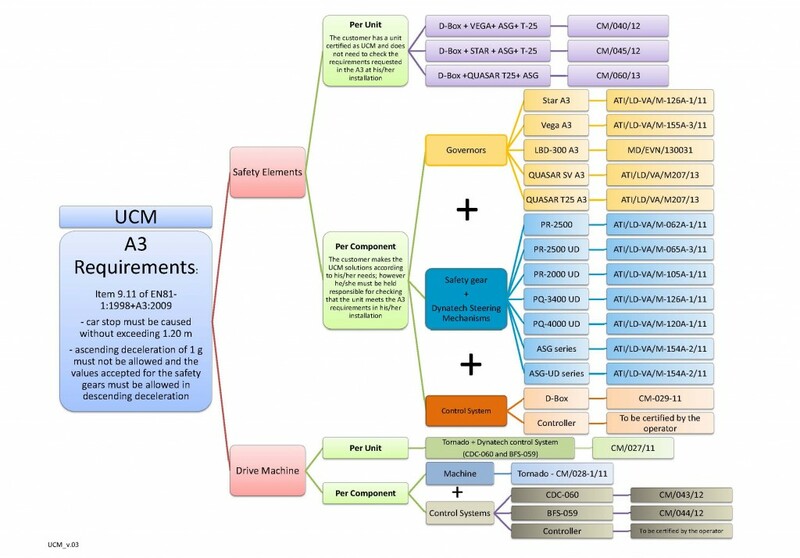 New Diagram for the Implementation of the EN 81-1/2:1998+A3:2009 (UCM) Standards in our products. In view of the numerous doubts and queries from you, concerning the compliance with Standards: EN 81-1:1998+A3:2009 and EN 81-2:1998+A3:2009, we have produced a diagram in order to explain the processes relating to our products. This is an explanatory diagram that is constantly updated. As soon as there are any modifications in it, you will be informed by this same channel. We hope this information may be of use and help to you. We would like to take this opportunity to inform you that the D-BOX Control System + STAR Governor Unit + ASG-1XX progressive Safety Gear and T-25 Driving Bar have also successfully passed the Certification Tests and we expect to receive their corresponding Certificates in the short term. As soon as we receive them, we will let you know in the same way. A new check of D-BOX operating and maintenance instructions are available now in our web site, in: english, spanish, german and french. 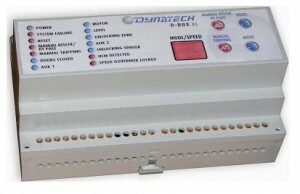 You can download it in our website www.dynatech-elevation.com, in PRODUCTS -> ELECTRONIC DEVICES -> D-BOX. We therefore ask all our customers intending to use our products in Russia to explicitly request these products for that country, so the product can be properly labelled. The D-BOX operating and maintenance instructions are available now in our webpage, in english, spanish, german and french. Authorisation Letter for the use of old Products according to the EN 81-1/2:1998 +A3:2009 Standards. The “Centre-Expert” (NETEEL) body is already performing the standardization tests. The first certificate drafts of the safety gears PR-2000-UD and ASG-100-UD are already available. Their final certificates and those of the products in the process to be certified will be received promptly. As soon as these certificates are received, they will be included in our website. 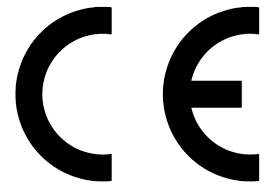 Please be advised that we now have the Type CE Examinations translated into French and German for all of our products certified under Addendum 3. As always, we have included these Certificates in the User and Maintenance Manuals issued in French and German, which are now available from our website. NEW OPERATING AND MAINTENANCE INSTRUCTIONS IN ACCORDANCE WITH ADDENDUM 3 AVAILABLE IN OUR WEBSITE. After years of working hard on several projects, Dynatech will launch its latest developments and patents at INTERLIFT. New QUASAR speed governor: QUASAR (Astronomy), “A quasi-stellar object, extremely compact and with high power and luminosity” Our QUASAR Governor is the heir to STAR technology, with a reduced 120 mm diameter but with a large range of applications, much larger than that of the current Dynatech governors. 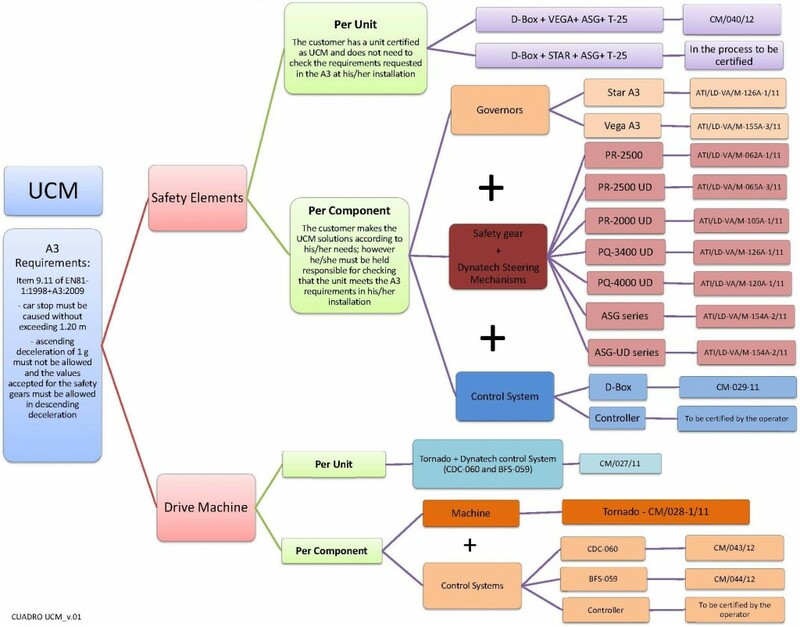 INTEGRAL System: “A new concept in safety systems”. Safety gear and speed governor fitted in a single part. This system is multifunctional for any type of frames, thus reducing both the cost of its manufacture and the gap between the car floor and the lift’s shaft pit to the minimum. At present, new products, such as the following ASG range safety gear models, are being designed: ASG-200 and ASG-200-UD. These may not be approved in time for the fair but may be displayed during it and their features disclosed in accordance with the preliminary tests. TORNADO gearless machines also incorporate new components: Bed plates for roomless lifts, bed plates for refurbishments, manual rescue system, adaptable pulley protections, etc. Even though the INTEGRAL system will be a true revolution in the lift sector, it will not be the only one. At any typical fair, exhibitors usually show their current and future products; what has never been seen before is that exhibitors both show their products and offer a different kind of business to their customers which they can incorporate to the current one without having to include additional costs. Therefore, the turnover is increased but the costs remain fixed. Dynatech is to launch a series of products which will be seen at Interlift and which are part of the Energy Efficient Building philosophy. An opportunity not to be missed: INTERLIFT 2011. The University of Zaragoza, Doctor of Engineering, Mr. Mario Maza coordinating the project. 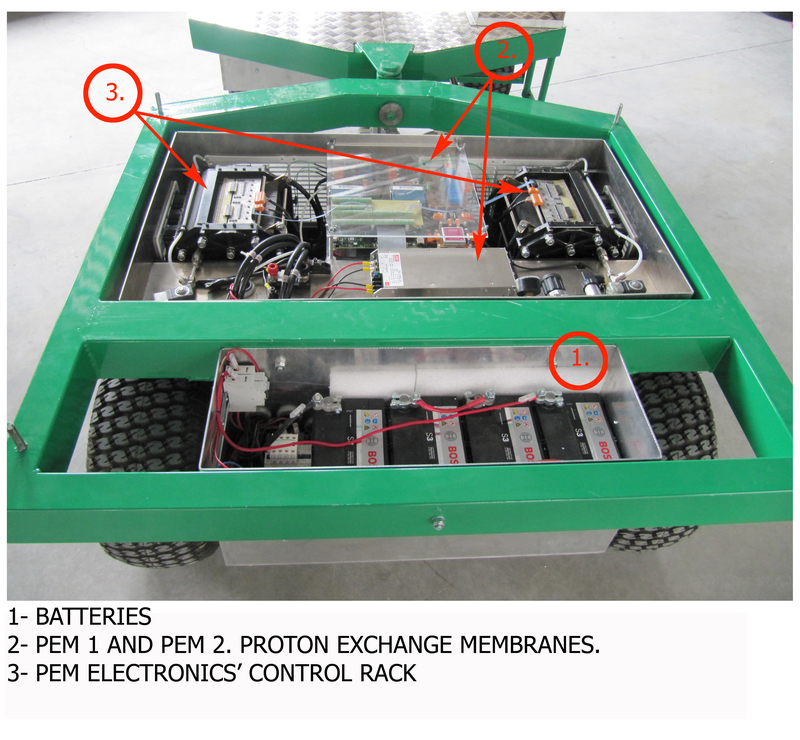 The Laboratorio de Investigación en Tecnologías de la Combustión (LITEC) developing the two PEM (proton exchange membrane) type batteries. The company Electrónica Cerler, S.A. developing the required electronic boards. The Fundación para el Desarrollo en Tecnologías del Hidrógeno en Aragón (FH2A), promoting the project. DYNATECH, sponsoring the project with the participation of Dynatech’s Integration Laboratory Director, Mr. Ramón del Cacho, and developing the entire vehicle’s kinematics and the integration of all its components for its correct final operation. Dr. Mario Maza, from the University of Zaragoza and Dr. Félix Barreras from LITEC, explain in two videos the vehicle’s functionality and degree of technical complexity (in Spanish). Rear: Space for the drivers. Rear. 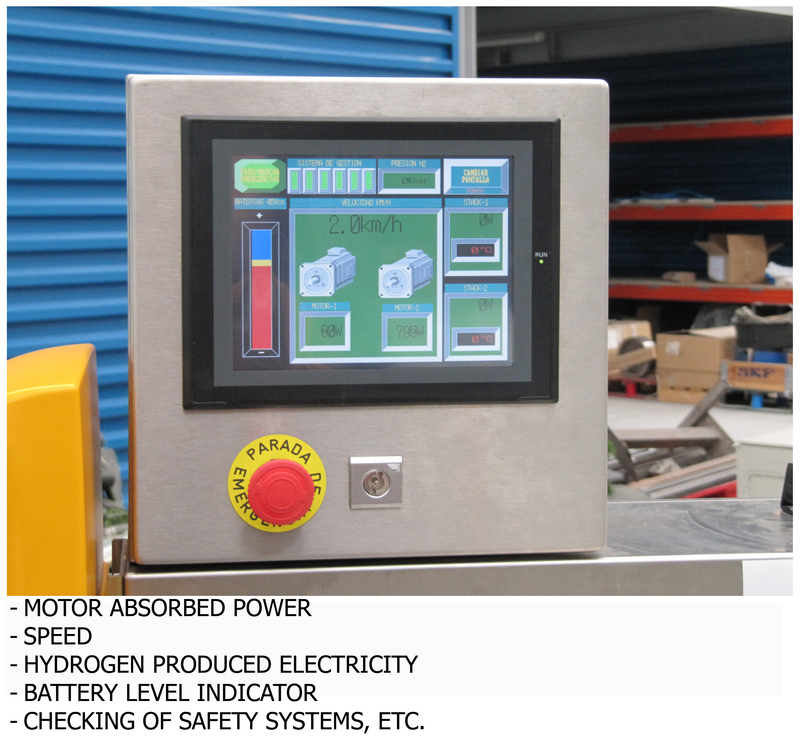 Data andVehicle’s parameters display screen. Rear General view: Explanation of other parts of the vehicle. 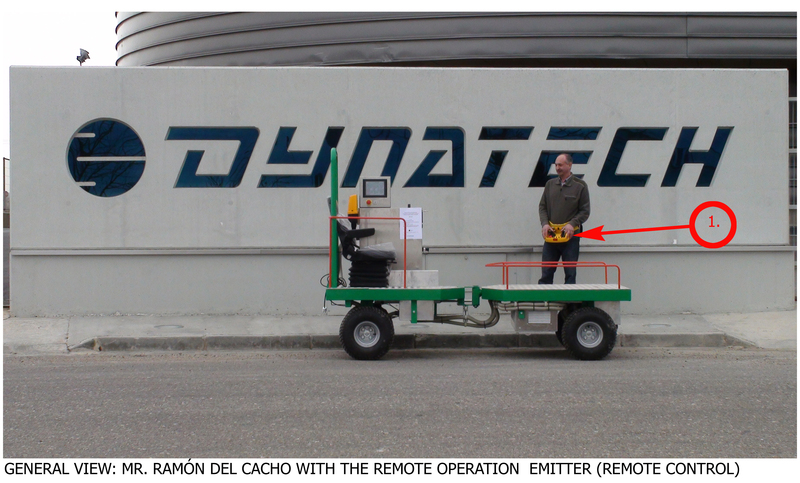 General view: Mr. Ramón del Cacho with the remote operation emitter (Remote Control). Picture of the development team. Interesting commentary about our company (in Spanish language) made by Ibercaja Social Foundation. This video includes an interesting interview to Francisco Mateo: General Mananager of Dynatech. Mr. Mateo talks about the TORNADO Gearless Machine (a permanent magnets synchronous machine), the most recent product of Dynatech. He talks about about our new developments of wind turbine power generators and of an interesting integration projects to mix: lifts, gearless machines and turbines too. TV report broadcasted about Dynatech. Video of the TV report broadcasted through the Aragonese channel “Antena Aragón” that shows Dynatech’s facilities and equipments for R&D+I, and the main products of the company: Safety Gears, Overspeed Governors and Tornado Gearless Machines. At 10 a.m., Carlos Pauner reached the summit of the GII. He was alone, he arrived tired but with a clear head, aware of the fact that the real summit was below him. A difficult descent awaited him, as there was an unequipped section and every caution must be taken. Raúl Martínez felt very cold and decided to stay at CIII. A wide decision. Raúl knows what ‘freezing cold’ is all about. He suffered the amputation of two of his toes as a result of freezing (on his ascent of Nanga Parbat 8125 m). On realising his health, his hydration levels, his strength and with a ‘cold’ head, he decided to give up. An exemplary gesture and actions praiseworthy of the person taking them. He fought like a titan, accompanying Carlos to the highest refuge, which was bound to be his prime reason for reaching CIII. He is a man of extreme generosity who looks out for the interests of others rather than his own. I am unaware of his current situation, but he will be somewhere on this mountain where he can be of use and not get in the way. Having Raúl nearby is extremely fortunate; those who know him are very lucky. Francisco Mateo – Managing Director of Dynatech-elevation – called yesterday to take a personal interest in the health of Raúl, Adrián and Carlos and showed the typical concern of someone who is familiar with great challenges. He asked about Adrián, whether he had arrived safely and whether he was physically and mentally fit, and then about Raúl and Carlos. He asked me to tell him as soon as I had any news. He is another man with exemplary behaviour, someone who never shies away, who appears whenever he can offer his help and who adds but never takes away. Thanks for everything, Fran. We will inform you as soon as we have any more news. 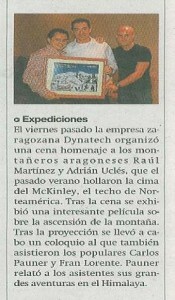 On 25th March, there was a ceremony at Dynatech as a tribute to the members of the expedition Adrián Uclés, Raúl Martínez and Fran Lorente in recognition of the effort made last year during the 2010 DYNATECH – ALPAMAYO expedition. During this expedition, they managed to put our flag on the summit of the Alpamayo, claimed to be “the most beautiful mountain in the world”, and on two other summits as well: Pisco and Vallunaraju, all three in the Cordillera Blanca in Peru. The event was a lunch at our facilities and ended with a presentation of glass statuettes commemorating the Expedition. Due to reasons beyond his control, Fran Lorente could not attend the event and Carlos Pauner attended the ceremony and collected this statuette on Fran’s behalf. FROM LEFT TO RIGHT: ADRIÁN UCLÉS, FRANCISCO MATEO, CARLOS PAUNER, RAÚL MARTÍNEZ. 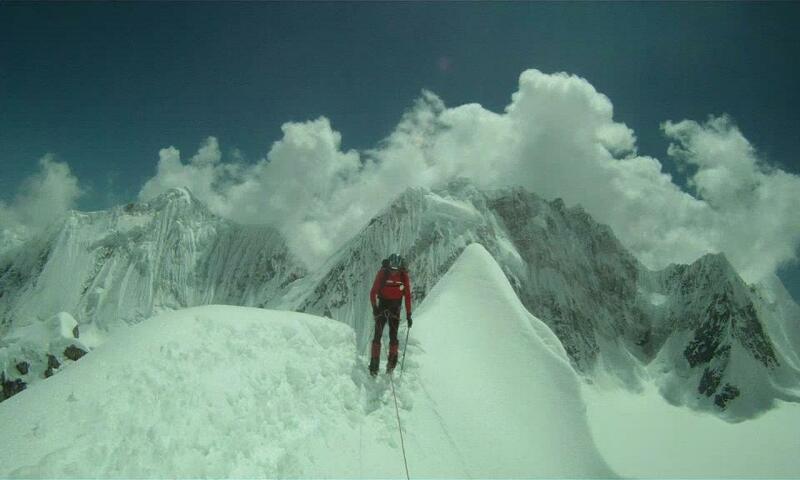 To conquer the Gasherbrum II summit. The Gasherbrum II, also called K4, is an 8,035-m-mountain located in the Pakistani Karakoram and is one of the 14 summits over 8,000m. They intend to make their ascent following the so-called “French Route”, opened in 1975 and never been attempted by any Spanish person. The 2011 DYNATECH – GASHERBRUM II expedition is an extreme challenge: A summit over 8,000m and an ascent made following an unusual route, where they will not find any other expedition to provide mutual assistance and share efforts. 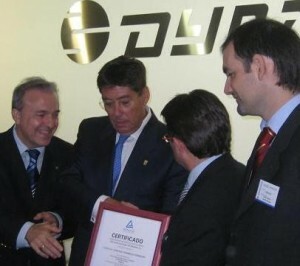 Carlos Pauner ( www.carlospauner.com ) gave the Dynatech personnel further details on the project. He is about to complete his own challenge which is reaching the top of the 14 highest mountains in the world, all of them over eight thousand metres. Up until now, he has reached 10 and, as we speak, he is at the base of the Lhotse (8,516m) to attempt his eleventh one. Here at Dynatech, we wish him to obtain the greatest success and to return home safe and sound. On his return from Lhotse, he will have about a month to recover from the effort made and, then, prepare his departure towards the K4. Then, the members of our expedition, Adrián Uclés and Raúl Martínez (Fran will not be able to participate this time) will join Carlos to undertake this challenge. In addition to our own team, Carlos will be accompanied by Javier Pérez, Isabel Santolaria and Juan Carlos Cirera, all of them from Aragon; therefore, the expedition will be 100% Aragonese. As soon as we are given any news, we will inform you of it. The original text from this article has been permanently removed. Even though it has not been updated, since it is dated on 09/11/2010, and the current circumstances are completely different from those on said date, we see that people continue to read this article and consequently the reader may misinterpret its message. In place of the original text, we are providing you with a hyperlink that will allow you to access the latest updated information. To access the updated information please click here. Recommendation to visit our website. If using the Internet Explorer browser to visit our website www.dynatech-elevation.com, please use version 8 or newer to view it correctly. 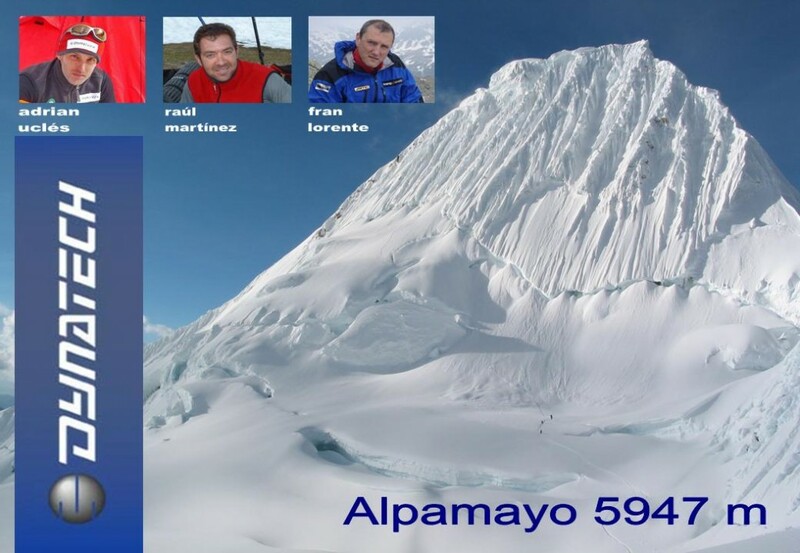 The project known as “DYNATECH Alpamayo Expedition” is an attempt made by a group of experienced Aragonese mountaineers to reach the Alpamayo summit, a 5,947-m mountain located in the Andes Cordillera Blanca in Peru. Why the Alpamayo? 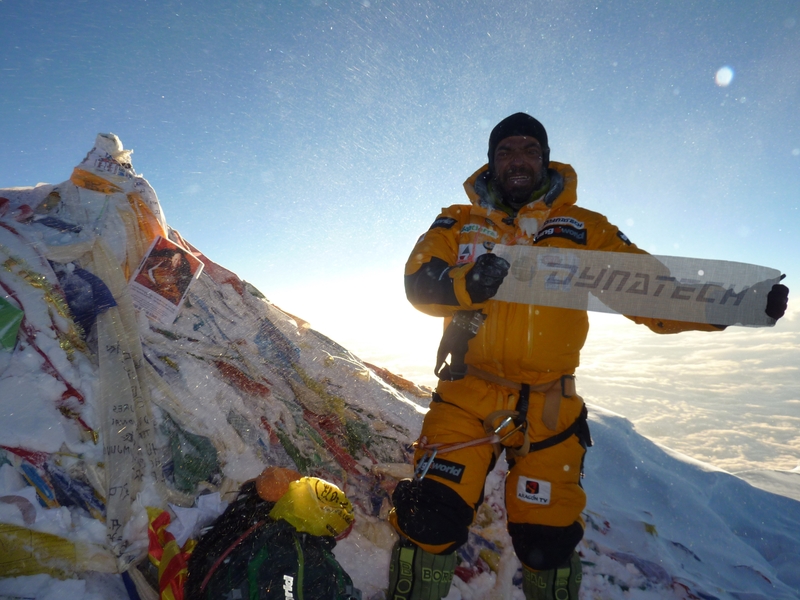 When a mountaineer faces a challenge, more than one reason motivates him to do so. The “DYNATECH Alpamayo” project was born as a continuation of the attempt, and later successful achievement in 2009, to reach the mountain known as “the coldest in the world”, a name given to the McKinley, in Alaska, with a height of 6,194 m., which is also the highest mountain in North America. In our search for new and demanding challenges, DYNATECH has set its eye on the Alpamayo, 5,947-m., which is known as “the most beautiful mountain in the world”. On one hand, this mountain attracts a massive number of mountaineers due to the beauty of its lines; on the other hand it only has very few routes open (all of them at the end of the last century), which, without a doubt, says a lot of the difficulties its ascent entails. There are only three routes (and one alternative route) open on the SE face (undoubtedly the most beautiful face) and the direct French route is the most difficult one, technically speaking. This is the route chosen by the group, which implies, if possible, a bigger challenge than the ascent itself. This route, which was climbed by an American roped team in the 80s, owes its name to two French mountaineers who attempted its ascent but died in the process. It is a technically difficult route as it includes a 450-m climb on icy snow with an average slope of 65º and the last 3 climbing pitches may have an 85-90º slope, in other words, they are totally vertical. Apart from the other difficulties this mountain entails, there are imminent risks of avalanche, temperatures reaching minus 20º and winds of up to 70-80 Km./h., as well as the proximity to the Pacific implying a very changeable weather, all of these factors make it a high risk ascent with a low percentage of success. For these reasons, the challenge is exciting albeit serious and not risk-free. For this ascent, the group, which is highly experienced as its members have climbed summits of 6000, 7000 and 8000 m., is being cautious about this challenge, planning a progressive acclimatisation in order to avoid one of the main problems caused by such a challenge: height; and, trying to open a new route on this or another mountain in the Cordillera Blanca, if the circumstances are right or allow to do so. Next Saturday 17th July, the expedition sets off to Lima (Peru) and will return on 13th August. Our next reports will be sent directly from Peru. We hope that, as a great mountaineer of the 20th C once said, they all return, return as friends and have a successful ascent, but always in this order. 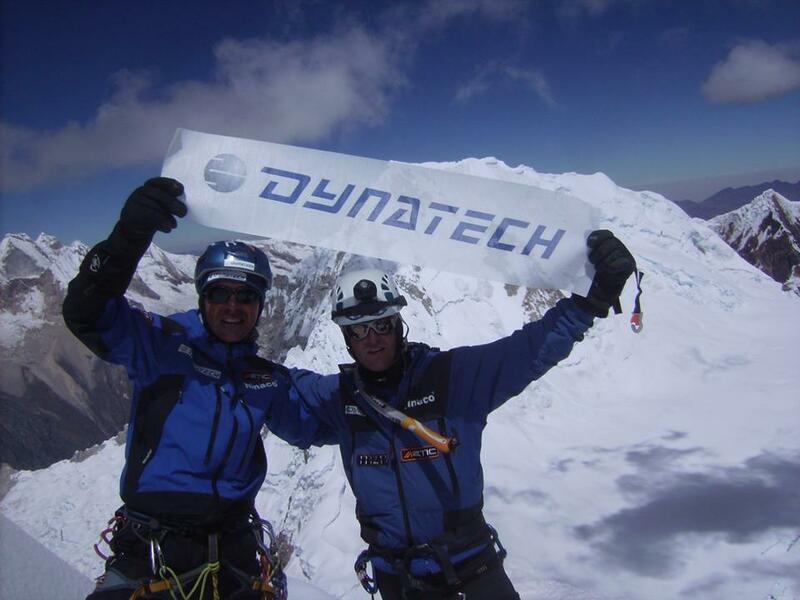 On last 9th October, Dynatech organised a tribute dinner at the Hotel Boston in Zaragoza for the mountaineers Adrián Uclés and Raúl Martínez who placed the Dynatech flag at the summit of the coldest mountain in the world and the highest in North America: the McKinley-Denali (6200m. Alaska). Apart from the members of the expedition and Dynatech personnel, Fran Lorente, narrator of all the daily reports transmitted via satellite by the expedition, and Carlos Pauner, a professional mountaineer and friend, were also there. When the dinner ended, there was a brief commemorative prize-giving ceremony and, immediately after, the showing of a video of the expedition. Once the showing finished, all the audience could hear the details of this adventure told by their true protagonists. Numerous questions on the climb were also made which were properly answered by the members of the expedition and by Carlos Pauner as well, a famous “eight-thousander” and prestigious guest that gave a real master class on the mountain world, its difficulties and limits of the human being in this hostile environment. The story was covered by the local press. Enclosed is the corresponding article. 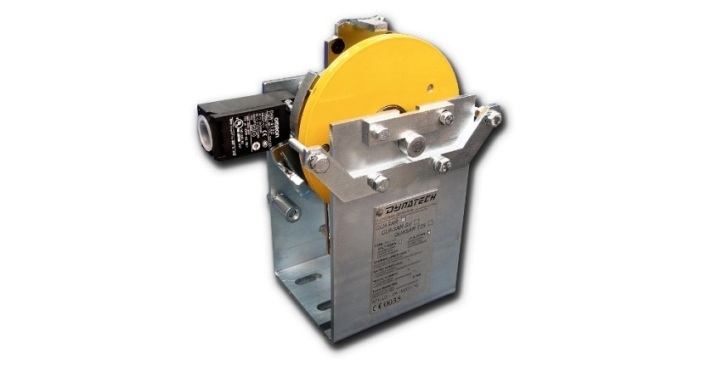 - Overspeed governors can be provided optionally with a rectifier pre-assembled. With this option, the customer just need to connect directly the system to the 230V AC power network. In this way and with a minimum cost, the customer has not to install a rectifier current himself and the transformer. 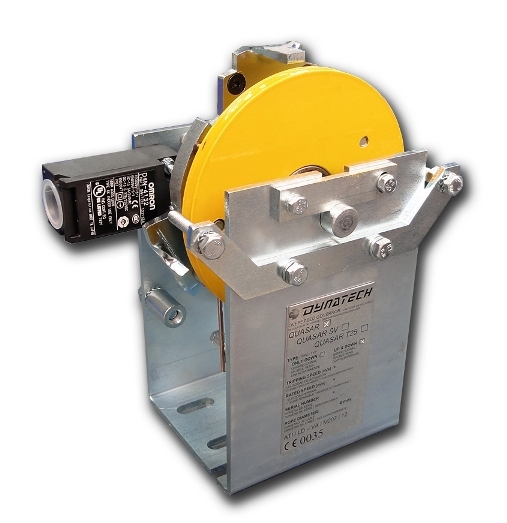 - The rectifier included in the overspeed governor comes encased in a plastic box with an IP 66 protection. - The rectifier connection to the solenoid is by means of Fast-on coated. - Easy connection to the 230 VAC power network. 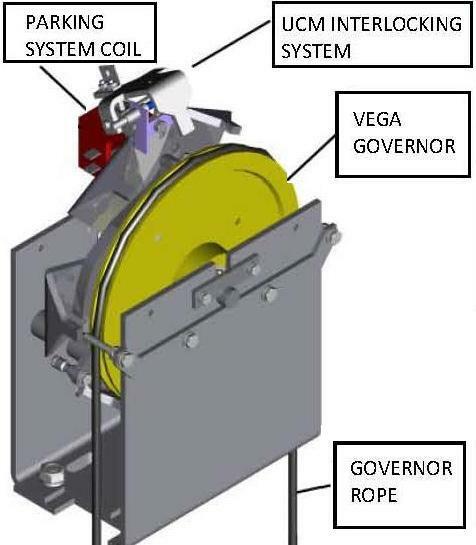 Overspeed governor Vega with anticreep system and RECTIFIER. 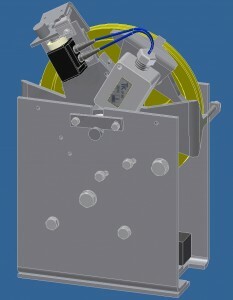 - Remote tripping mechanism with 190 VDC solenoid (STAR, VEGA, LBD-200, LBD-300). 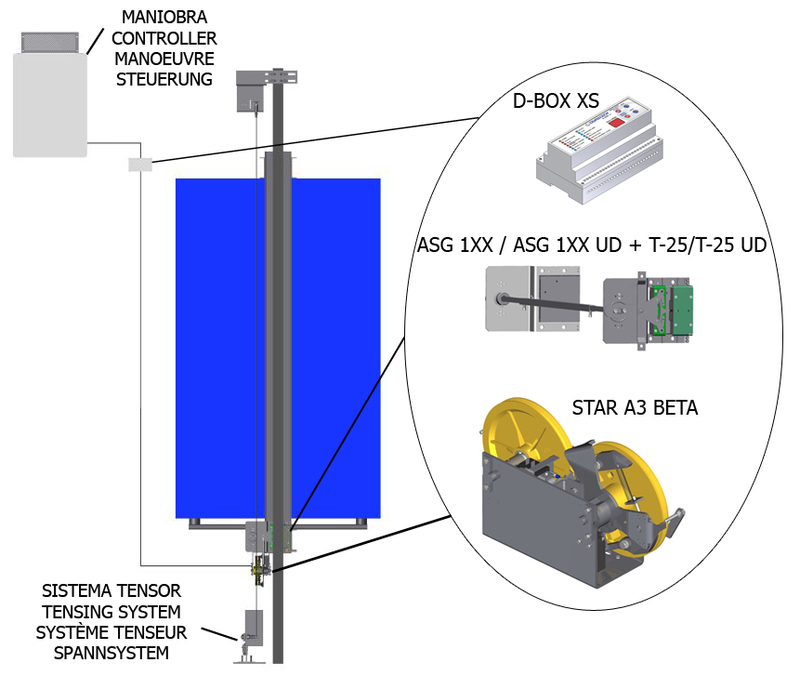 - Anticreep system with 190 VDC solenoid (STAR, VEGA). “Hello everybody. Last 18th June dawned in bad weather in Camp IV. We hesitated to descend, because it was snowing much and there was a poor visibility. There was not a forecast improvement and we did not want to spend more time on the glacier under these conditions. We talked to the Australian team and decide to form a strong rope of five people and began the descent. In this way, we increased the security. Without delay, we packed everything, we loaded it on the sleds and on the backpacks and we started to descend. The first stage until the Camp III was very hard. Practically, we went opening footprint, snow storm was very uncomfortable and the land with half and steep slopes made our walk with the sleds difficult. After more than two hours, we arrived at Camp III. There, a depot with more load, our skis, food and the third sled were waiting four us. Due to the heavy snowfalls, it took a long time to shovel for unearthing everything and we had to make a great effort. The Austrian climbers made the same, and then with five sleds we began the way. From here the land is less abrupt, but the load is heavier, and besides, as we went descending on the glacier, the risk of falling into a crack was bigger, so we had to act with more caution. The accident happened to the Malaga expedition the previous day reminded us that we could not relax. After long hours of walking we arrived at camp I. Weather had improved, at this altitude the snow had stopped, but the sun hid behind the mountains, and although here in Alaska, in these months don´t disappear altogether, temperatures drop sharply when the “night” falls. It was 21 hours, we were very cold, and we coooked a little to get our strength back and we melted snow to drink. Here also we had food and rubbish depots which we had to unearth. When we left in the morning, we had not still decided exactly until where we could arrive. We had been walking for more than eight hours and we were tired. Eleven kilometers still left, seven of which were ligth descent and the last four of ascent until base camp. One option was sleep here and leave the next day, but then we chose to continue. The glacier since we entered the park had lost a lot of quality. The high temperatures on the first days, together the snowfalls on the last days had turned it into a maze of cracks to circumvent. Low temperatures in the night compact the snow, so the navigation at this time is more secure. So we set off again at 23 hours and gritting our teeth we started our last stage on this mountain. It was specially hard, the quality of the snow was really bad, it took a long time to advance with the sleds, and the load and the walking hours began to feel in our legs and backs. The noise of avalanches joined us during this last phase, bursting with violence into the silence of the glacier night. With a few frights that never exceeded of putting a foot into a crack, we arrived at the the basis of what they call “Heartbreak Hill”. Really, the name is deserved, because after all, when you see the height of the base camp (300 height meters difference) and how long are going to be those four kilometers, not only breaks your heart, but also your soul. But expeditions are like this, an endurance and strength test, in which we must give everything to the end. It is said that a summit is not consummated until arriving at base camp, in this case, the proper base camp, more than ever, is a summit itself. Finally, after more than twelve hours of effort we set our tent and on friday, at 2 h. a.m., we prepared to rest a few hours in the hope of flying the next day. It wasn´t a nice night, because the sweat cooled in the sacks that ended flooded, but it did not matter, we were so near the desired hot shower and clean clothes. A canvas chair and a jacket left out by the Rangers, made us trust that they could expect good weather and that definitely the light aircrafts could fly. it’s hardly surprising on this mountain have to wait for several days at the base camp because of the inclement climatic. Almost when it seemed that we were to sleep, a female voice woke us up, Lisa, the Ranger in charge of the base camp, she asked us from out of the tent, if we wanted to fly, our company had a light aircraft which would land in half an hour. The happiness made that the soft bodies bring that reserve out and in a moment everything was into the backpacks again and over the sleds, everything on the back and on the sleds because on this endless mountain we still had to climb a slope. Due to the snow quality, it was getting worse, the light aircrafts need travel a longer distance to take off. So, again, more than half an hour pulling a load, heavier than ever, because we had unearthed the depot of food left in the base camp in case of staying here for several days more. Finally, we loaded everything on board, at 10 h. a.m., and without any problem, Paúl, an expert and veteran pilot, took off and we delighted with the wonderful aerial view of this impressive glacier. While we were flying over Denali, the images of those snows and mountains, were mixed with our lived moments, days of effort and life together that will remain in our memory forever. The McKinley mountain, Denali for the natives, has become a greater challenge than expected. The fact of carrying everything up by oneself, and the height difference of more than 4000 meters to overcome, gives you an extraordinary hardness. Climatology, one of the deciding factors on this mountain, has been favourable, but also, has led us to bet on a fast attack, because weather forecasts were few encouraging for the following days, as it was confirmed. It led us to carry out a fast attack to the summit, without much acclimation, a risky strategy that had repercussions on one of the members, but time leads all. We landed in Talkeetna and when we arrived at the hotel, we lived some moments of happiness. The first was meet the Malaga expedition by chance and confirm that the accident in the crack was just a scare and it had only involved one member with broken ribs. The desired shower was the second moment of joy and happiness, after twelve days of sweats and a few changes of clothes, believe me it is needed. But the greater happiness of all of them was the moment of watching the computer and reading all the chronicle of our adventure in Dynatech website. Reading the messages of everybody, family and friends, moved us to tears, the chronicles written by Fran and your support messages. Although technology hasn´t reach at that altitude, surely your help arrived there and gave us strengths in difficult moments. From here we want to thank to all people who have made this adventure possible: Dynatech, as main sponsor, San Mateo driving school, Monzon Municipal Sport Board and Cinca Medio Area. We also want to send an special gratitude to Francisco Lorente, “Fran”, who has related in a expeptional way our experience. When we read them, it seems to us as if he were here with us. Thanks Fran, and thanks to everybody for your support messages. As Frand told in one of his chronicles: a successful expedition: all are back, healthy, and more friends. In this case, we add a fourth moment of success and celebration, the real happiness of the expedition has been read all of your messages and chronicles and feel you. From Talkeetna, Alaska, a very strong hug for everybody of the Raules and Adrián”. Change in our working hours. 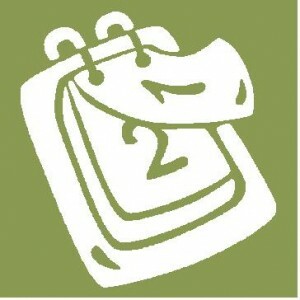 From Monday to Thursday: 8,15-13,30h. / 14,15-17,30h. Road to Dynatech from Zaragoza.